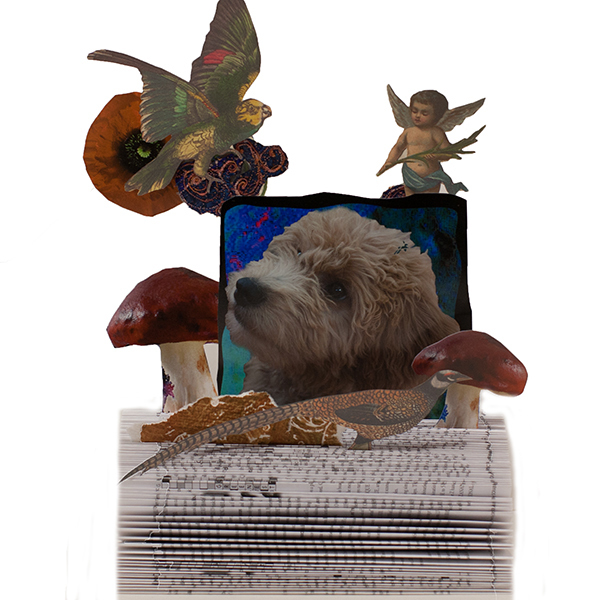 Oh it has been a long time since we last spoke…I have had the sad notebook computer repair tale going on for far too long. The repair quote was two weeks, I gave it 6 before my trip, and now I’m home and it is 13 weeks later without the repair done! Hence, three posts in one today! I hope nothing on the blog melts from all these photos. 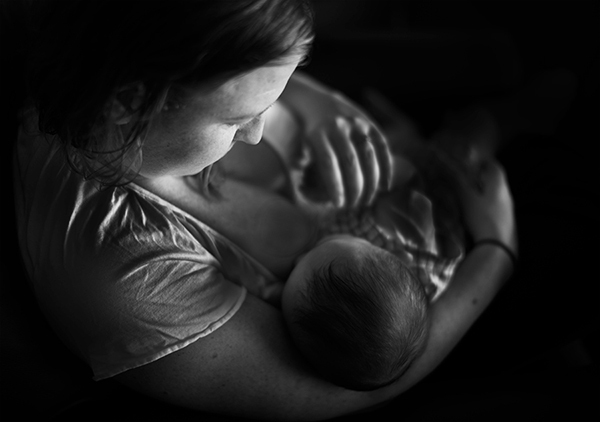 This is Jessica and the baby taken on Maui and for all you photographers out there, an exercise in closing down curtains in mid-day, bouncing the light off a reflector (white pillowcase at the condo) into the mirror to get the lovely catchlights in Mom’s eyes. 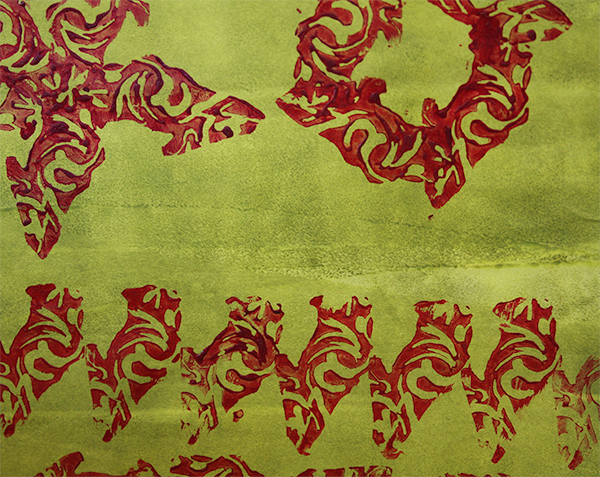 I love to print with fabric paints, thickened dyes, or acrylics on various papers and fabrics. I also enjoy making rubbings on top of the print blocks, then flooding with ink, watercolor, or pencil for an entirely different look. 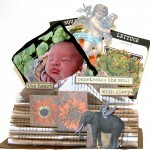 Tangie has a wonderful batch of print blocks for sale that I adore, and use often. These lessons will give you some ideas on how to design and make your own. In the future, I will give you all some of my favorite block cuttings tips and tricks, and also explore the various art media I like to print with. 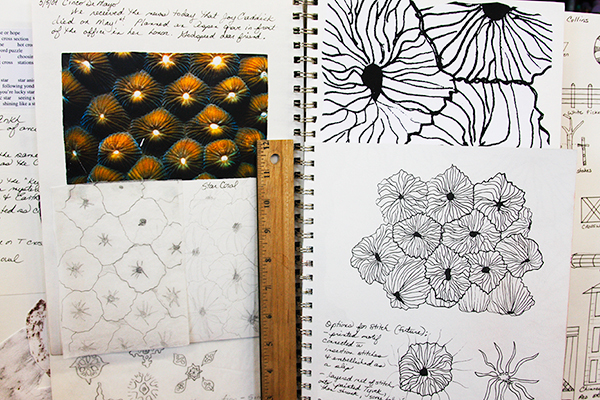 So for now…on to some design considerations! 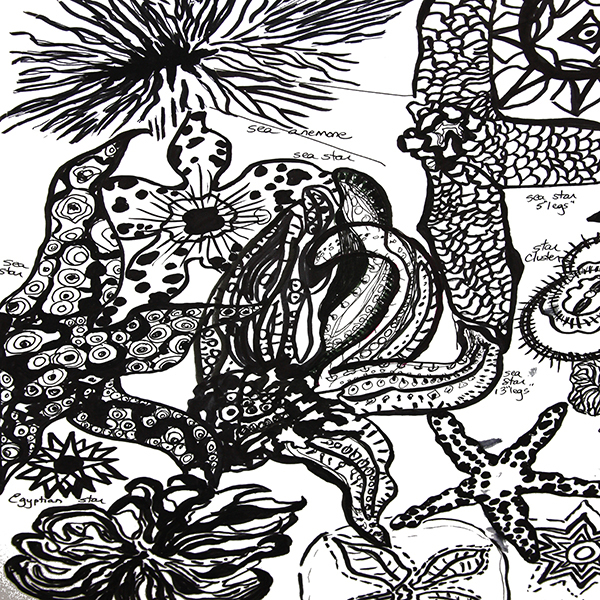 I will often make collages of my own or found photographic images when exploring a theme, or trying out a color scheme, then I will doodle, draw, trace, or otherwise check out shapes I am attracted to. 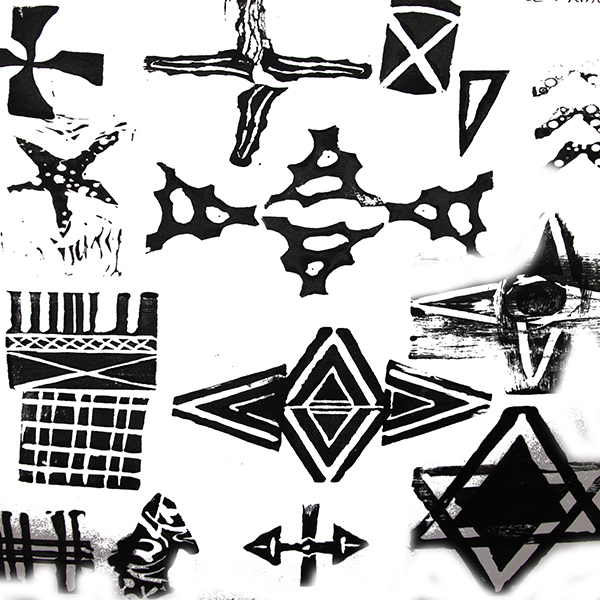 Once I identify a shape, I will trace or photocopy the motif, and add black marker to darken if necessary. Now the fun really starts! I sometimes can identify a smaller component of the shape that tickles my design eye right off, other times I will fold and cut or divide and cut and just see what I can get. 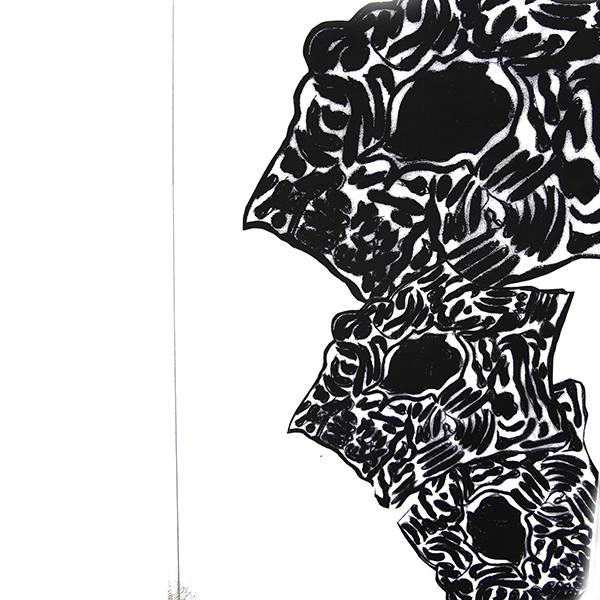 I will also occasionally use a small open frame to isolate shapes within the “mother” shape. 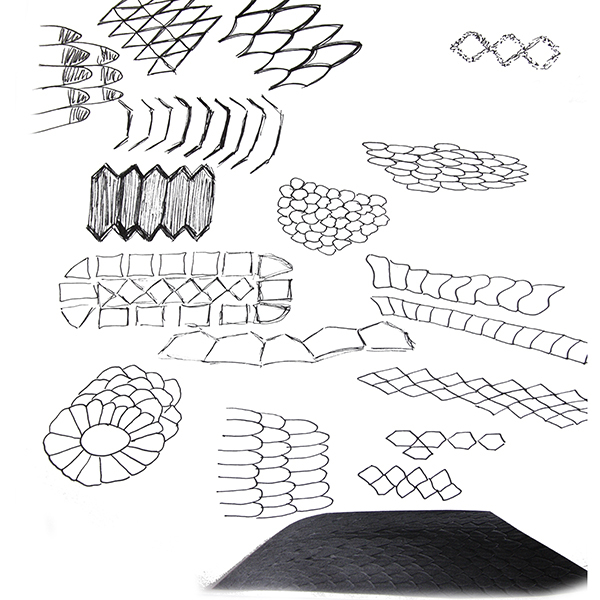 Once I find a shape I like, I will play around with various patterns: linear, half-drop, etc., and make new shapes with the one component, all with photocopies. 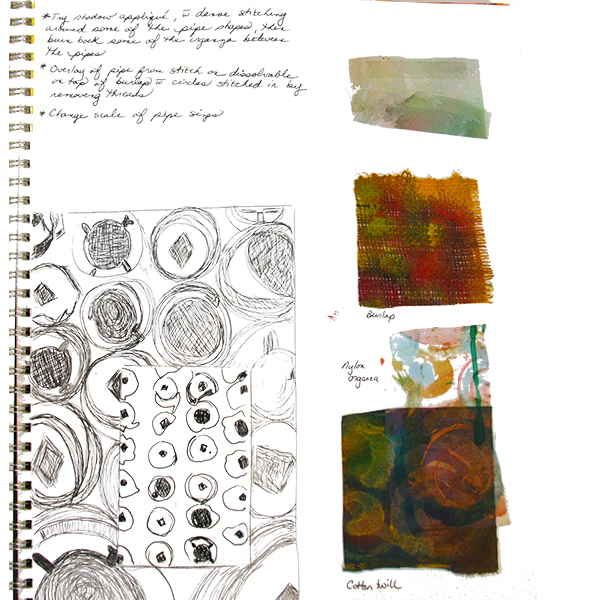 Below is an image of one of my big sketchbooks showing some of the tracing and photocopies attached to the pages with the original inspirational photograph…it might be a long time before I ever make a stencil or print block, but all the design work is done and safe in the sketchbook. 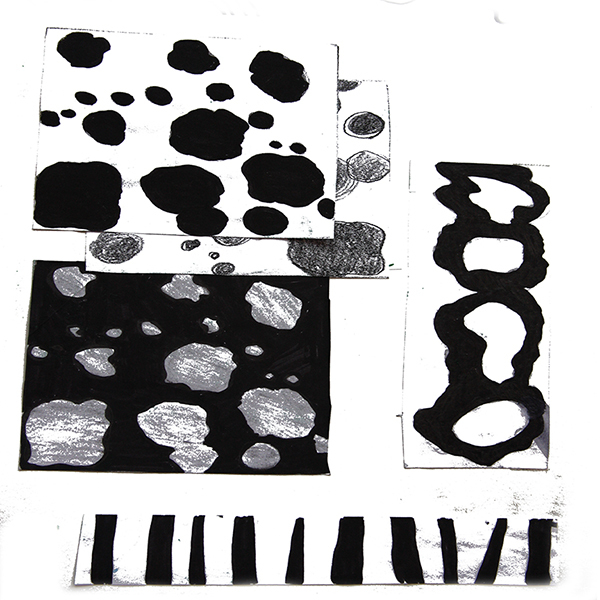 Some drawings before I cut the block, mostly to know what to remove vs. leave, the positive printing raised surface vs. the negative space. 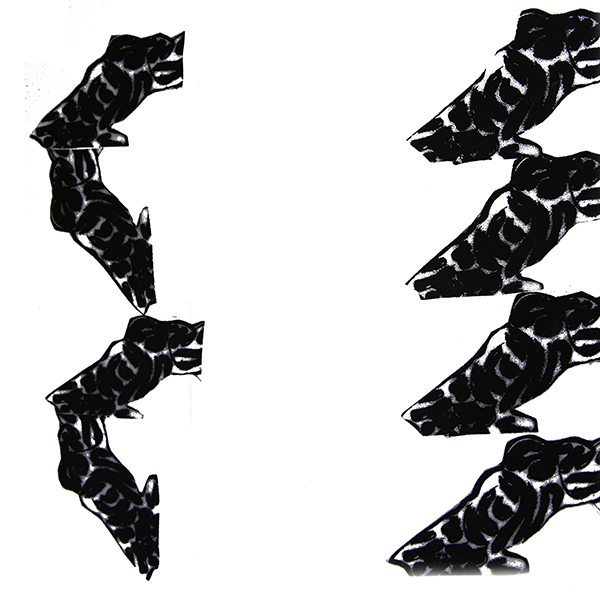 And here are some images of the above blocks in action. 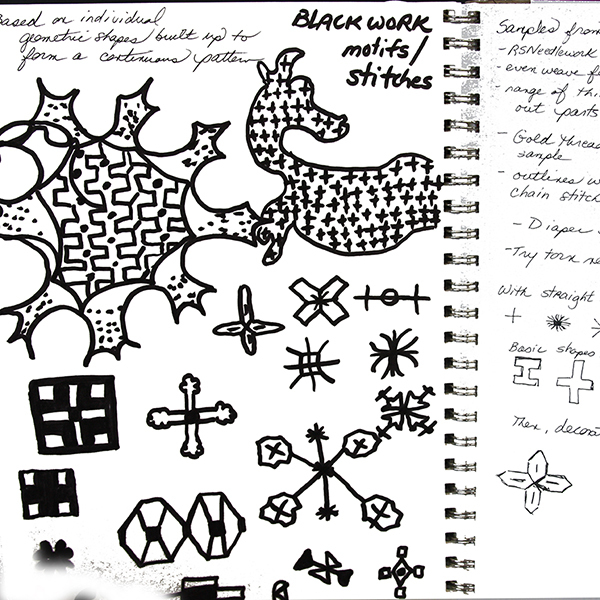 Once I cut the block, I will make a black on white paper print for my block inventory…it is easier for me to visualize if I see it printed on paper, rather than in the reverse on the block. that was a pretty messy example! Until next time, I hope you find some time to make some art! Hello all, and Happy Wednesday! This is a good example of value shifting within a complementary pair…if ALL of the oranges were at full opacity and saturation, it would look totally different and pretty much spoil the mood I wanted in the page, so most of the elements from Tangie’s January AJC14 collection on this page have the opacity down anywhere from 30-50%. Doesn’t that feel totally different as far as “mood” goes? 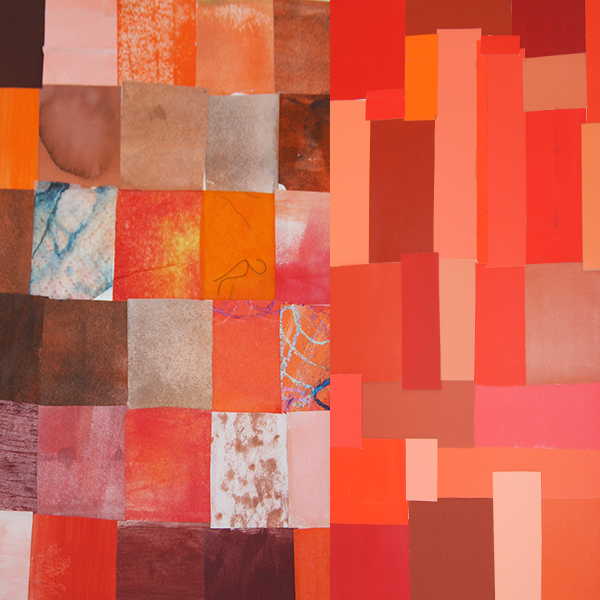 Value shifting in a color family in the main factor that determines the overall mood and tone of a piece rather than the hue family. I have often heard folks comment on yellow being “cheerful”, red as a “power color” , or blue “feeling serene”, yet when examined, it is the strength of the color that provokes certain emotional responses…I have seen pale, high value yellows look moody and sad, and saturated, dark value blues that feel anything but serene. These days many of my color choices come after I determine what mood or emotion I want to convey in the piece, then I choose hue and value, then accents and complements. 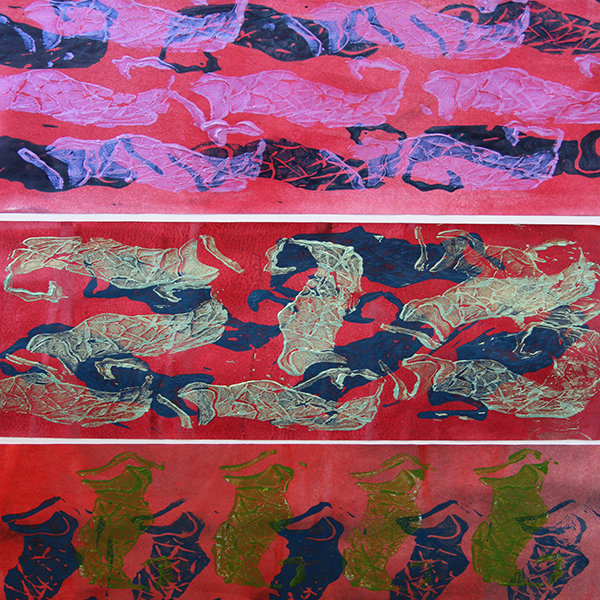 Below is an image of a rubbing I made…the background is sponge-painted acrylic, then Shiva/Markal oil paint stick rubbed onto the paper over a print block. The blue is iridescent. Notice how the lightest blue in the lower spiral becomes the focal point simply for being the lightest value? Next is a stitch sample, with orange as the dominant of the complementary pair. 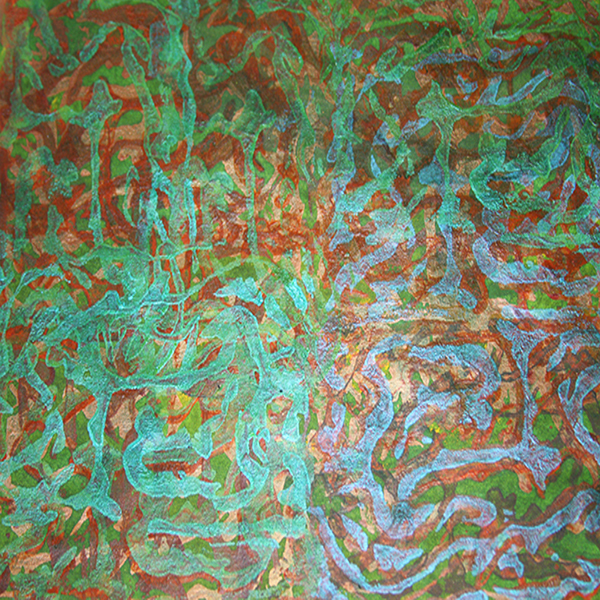 The thread was variegated from yellow orange to deep orange, and a blue to blue green. Notice how vibrant and clear the thread colors are against the left hand side vs. the center orange strip…the orange is so strong that it mutes the thread colors. 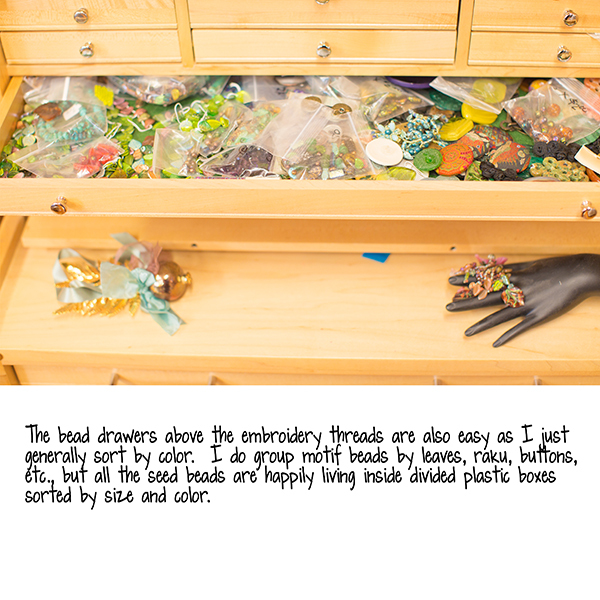 Obviously, there is a time and place for bringing the thread colors forward or back in the piece, and this sample was very helpful to me making choices for the finished wall quilt. 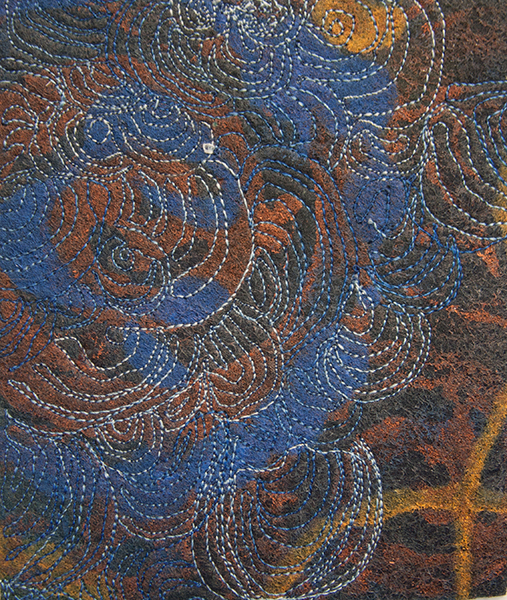 Here is another sample of stitching on printed/painted felt fabric, with a light blue thread. 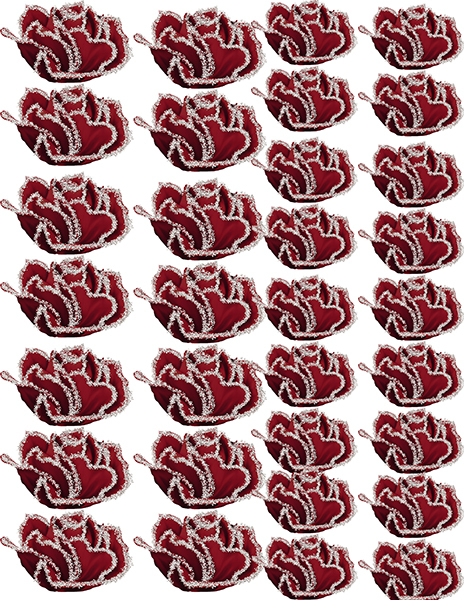 I wanted the wavy stitch pattern to be forward and the lighter value thread accomplishes this easily. Notice how the medium value blue thread recedes into the fabric, and takes a minute of studying the sample to see all the other layers of stitching. 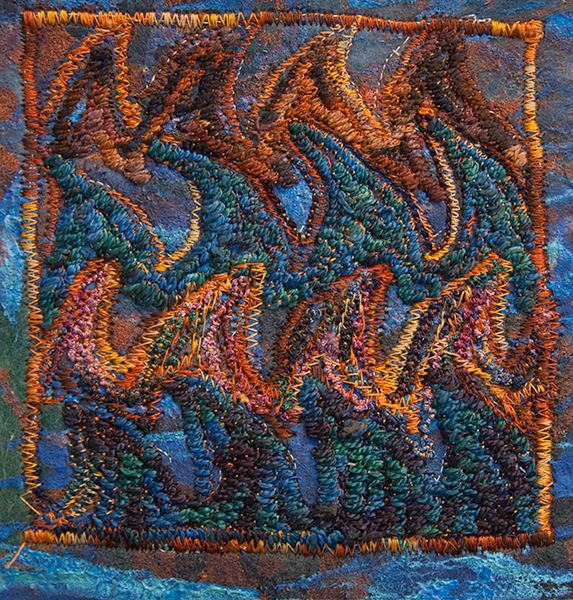 I created depth in the piece using the various values of thread rather than layering more fabric or paper, then top stitching. 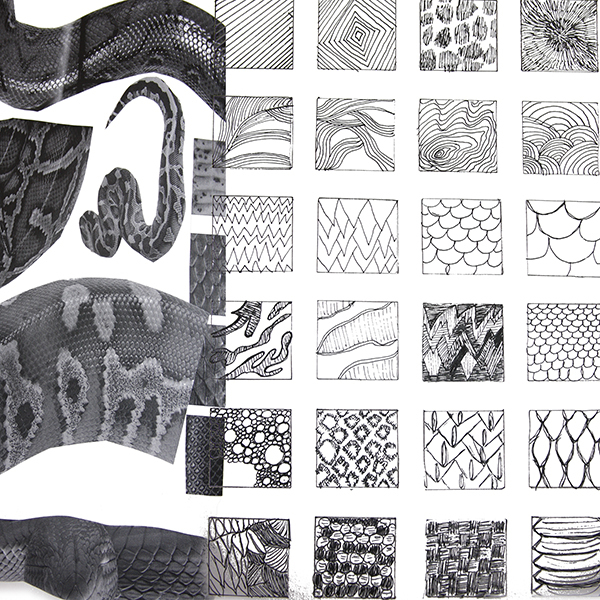 This is easy to mimic with markers, pencils, or other art tools, using the lightest value to create pattern on top of your page, almost like a layer mask in Photoshop. 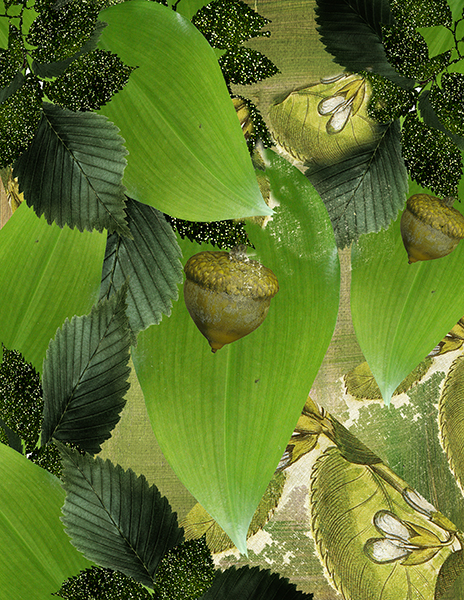 In the next sample, I have heavily satin stitched, and used some free motion zigzag to create the wave points onto the same background printed felt fabric as the sample above. 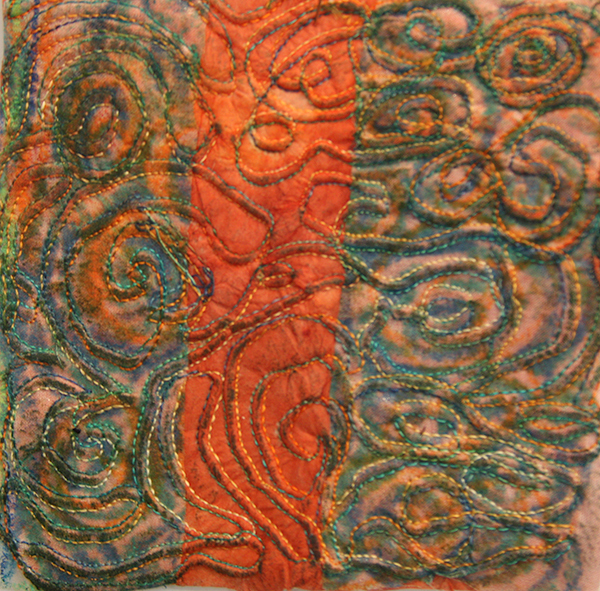 The orange variegated thread colors are visible in the square stitched border on the inner edges, ranging from pale to dark, shaded orange-brown. 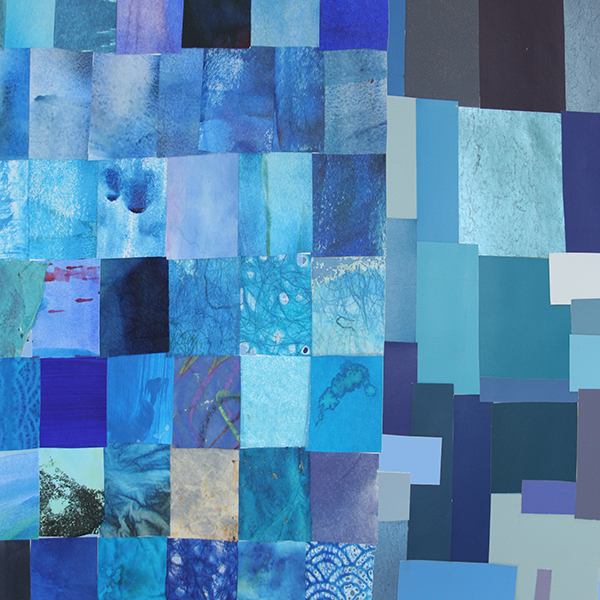 The blue wave points add tremendous levels of texture and depth because they are a medium value, so not the primary focal point. 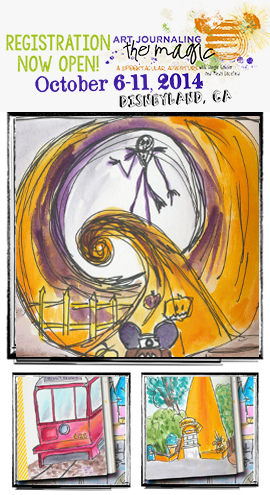 Again, easy to apply these same ideas to hybrid or digital art pages. 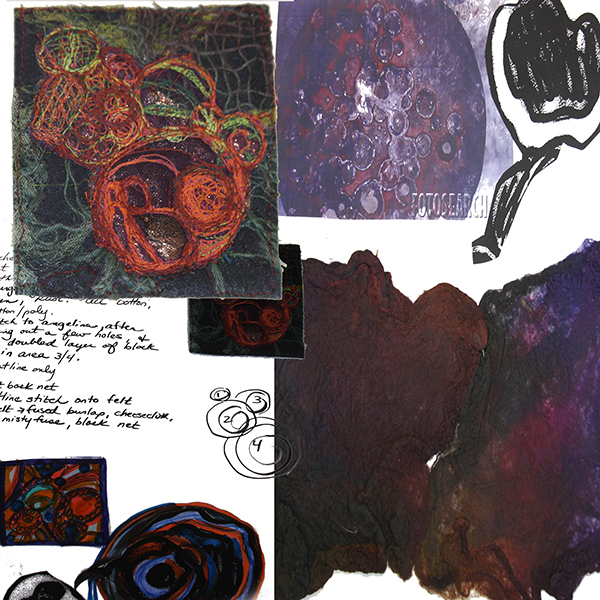 Here are four pages out of my working sketchbook about a piece on rust…color studies with watercolor and inks, some pencil, printing and painting fabric, a few stitch samples, this is generally how I think through a major piece of work before launching. I write notes to myself, ideas of other things to try, then a lot of times go off into entire other pursuits before returning back to working on an idea. Some of these never make it out of the sketchbook phase, others might see the light of day in a completely different form, even years later. I love having a shelf full of working sketchbooks as time passes and I revisit entire emotional experiences through my samples and thoughts. 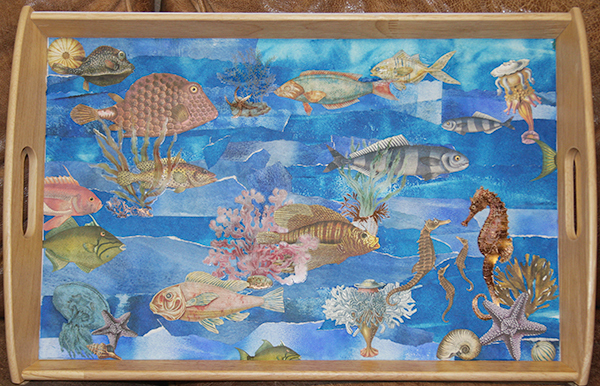 A previous Tangie Baxter blog post on making trays with torn painted paper and Tangie’s collage sheets…note the totally muted orange family in the fish and sea life vs. the vibrancy of the blue background papers. 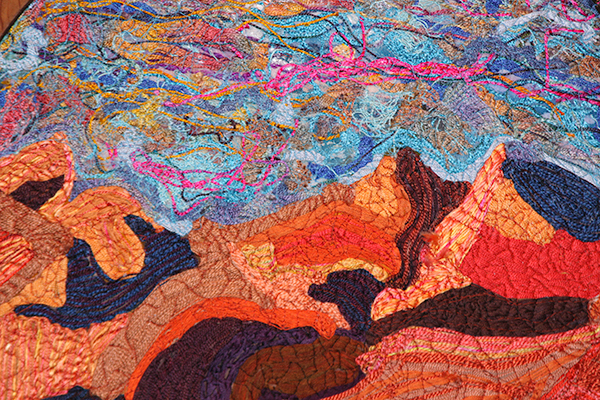 This is a close-up of “Morning in Merzouga” , a densely stitched piece that measures 3 X 2 feet, also featured in a previous blog post with the paintings underneath the stitching. This is a great example of using a color’s complement as an accent to accentuate contrast. 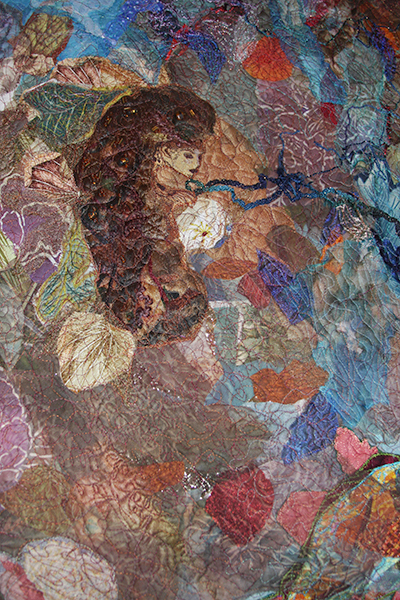 And finally, a close-up of “Elemental Dance”, 4 X 3 feet, stenciled and painted fabrics, thread-painted face and hair, fused silk paper, all dyed and painted by hand. 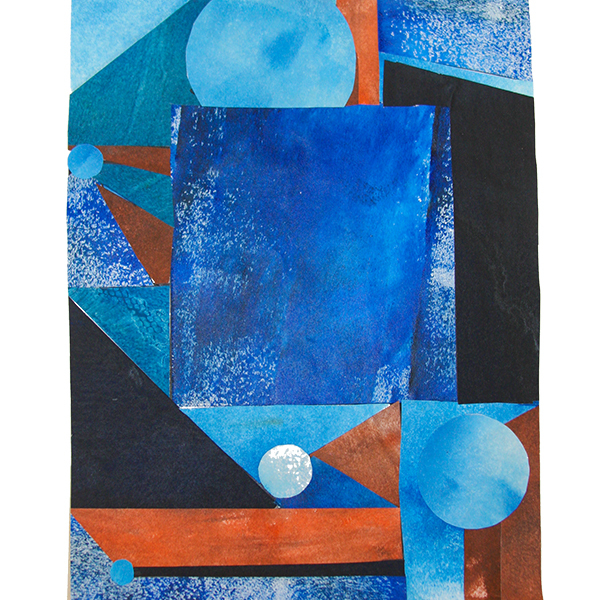 Here is Earth, many values of orange with Water edging in with all of the blues. 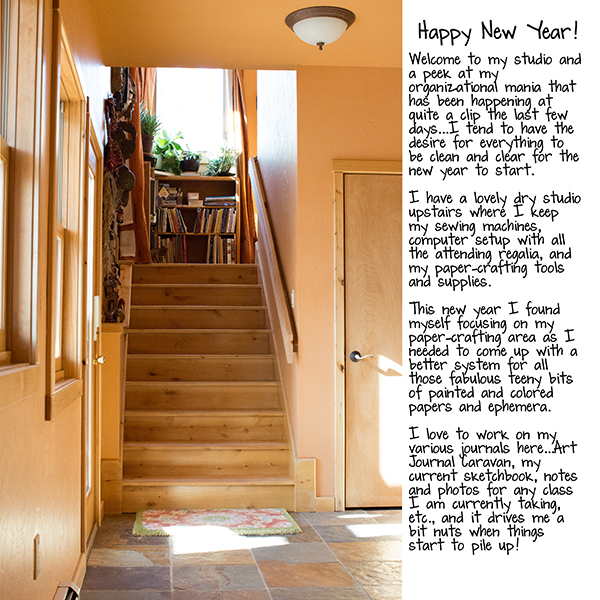 I’m off to enjoy the lovely low 50′s and sunshine we are currently having in western Colorado…I hope you can find some time to make art today. I hope all you are staying warm in the areas of the country that are in the deep freeze! Yikes, Batgirl! Wind chill numbers keep scaring me, although here in western Colorado it has been lovely and sunny even though cold at night. I have seen photos from Ontario where the snow is two and three feet deep…wow! 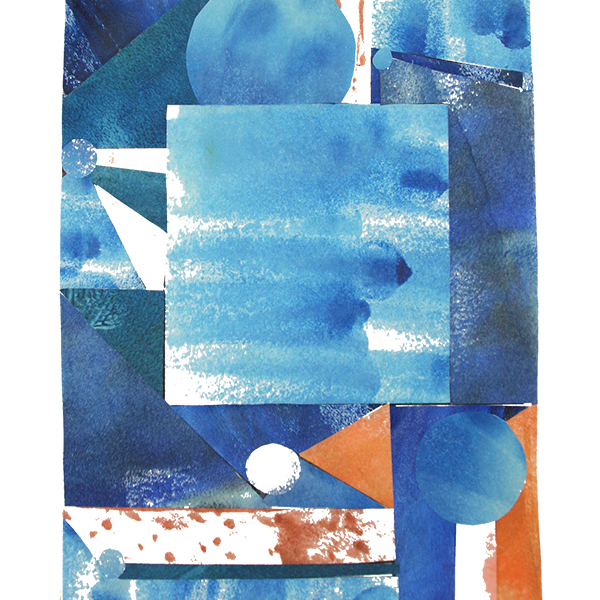 So for this chilly week I am exploring the blue/orange color complements. 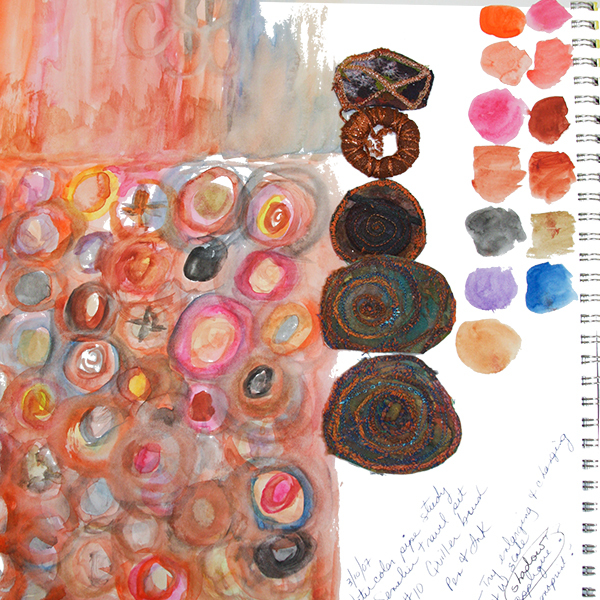 I love, love, love, using complementary color pairs to make neutrals like grays and earthy browns in everything from thread, dyed fabrics, colored pencil, and paints of various types. It is so easy to make beautiful, illuminated neutrals rather than the flat color that comes with just adding white, black, or gray. So what is a complement? 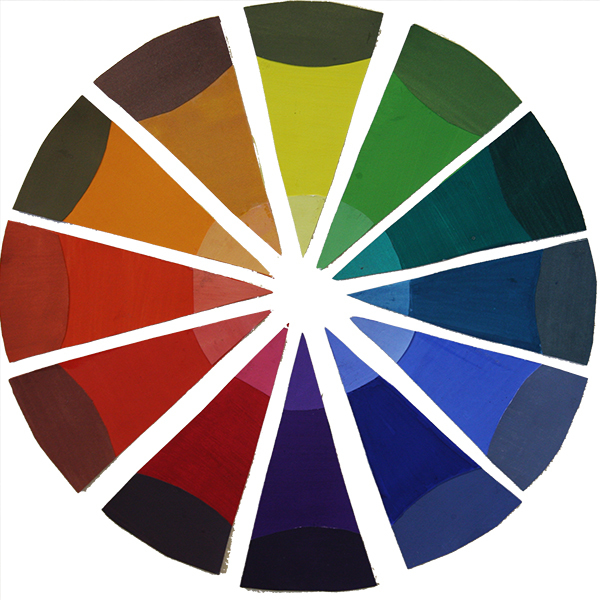 Basic definition: colors that are directly opposite on the color wheel. This is the key to totally successful and controlled color mixing! 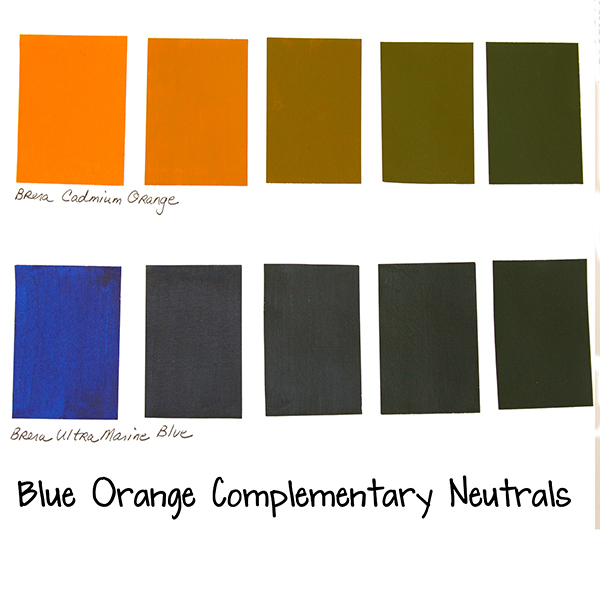 Below I have drawn a line between the two blue orange complementary pairs…each paint chip has a specific name below it. 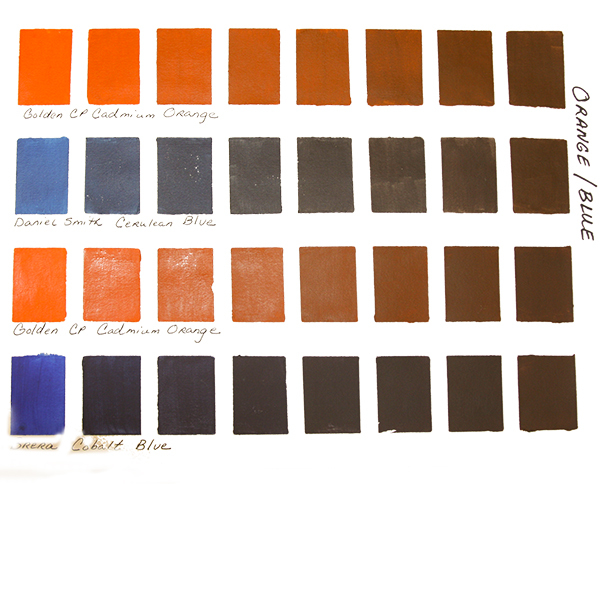 These are the specific colors in acrylic paint that act as true complements, and will gray or brown out when mixed together. 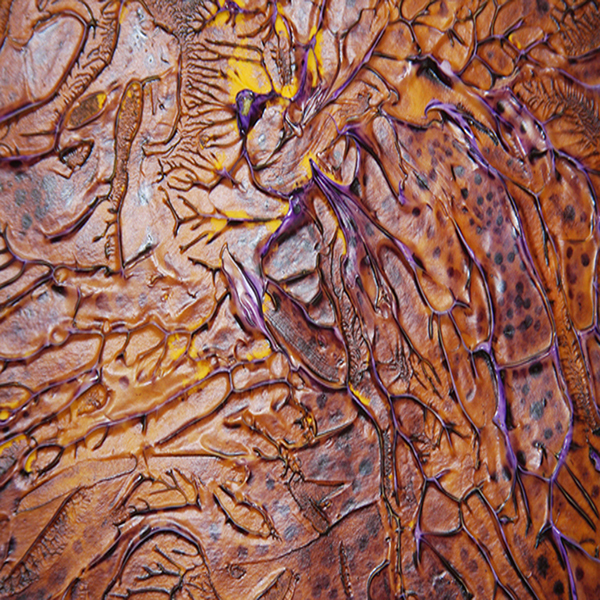 Have you ever made mud rather than the beautiful color you were expecting? That is because mixing a pigment that is not absolutely true to color will not behave as a complement would. 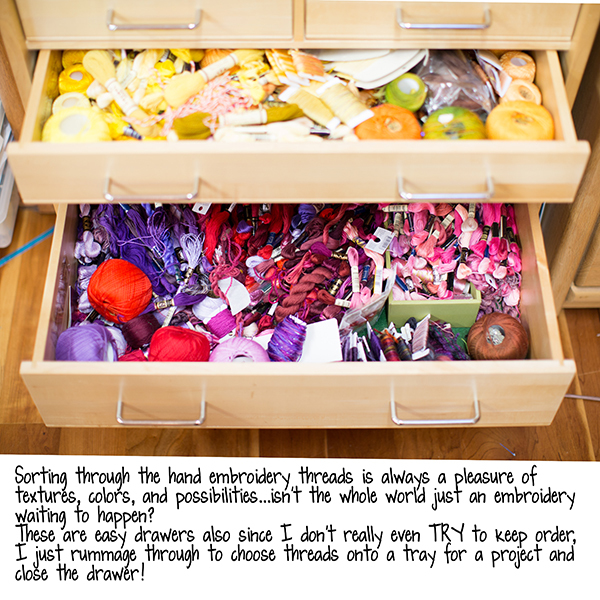 This is also true with watercolor, poster paints, fabric dyes and paints, colored pencils, inks, basically anything that can be mixed together. It is super important to identify a true primary to make secondaries, and on and on. Otherwise, everything turns to a moody, glunky brownish gooey color. 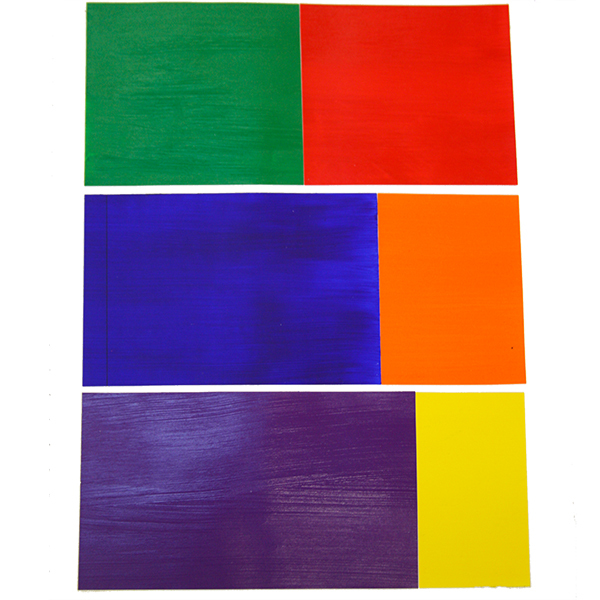 Now, of course, there is too much of a pure complementary pair if the proportions used in your work is way off…below is another batch of samples I made with acrylic paint, showing the accepted proportions in the art world of the 3 main pairs of complements. 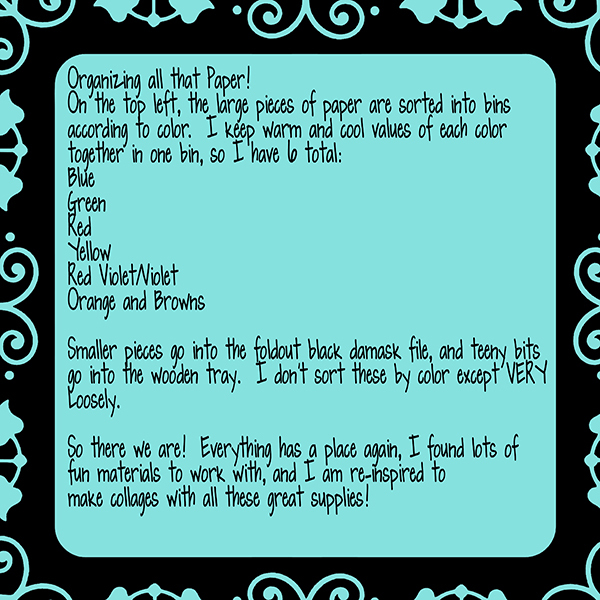 In plain English, while you may really enjoy an art journal page with equal amounts of red and green, the same will never look quite right with violet and yellow! 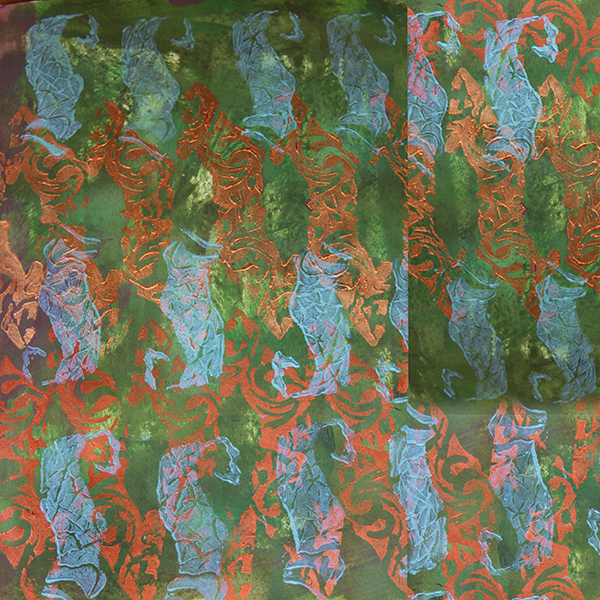 I made these samples VERY saturated and bright, not a choice I would make in my work, where I would tend towards a lighter or darker value of one of the colors. 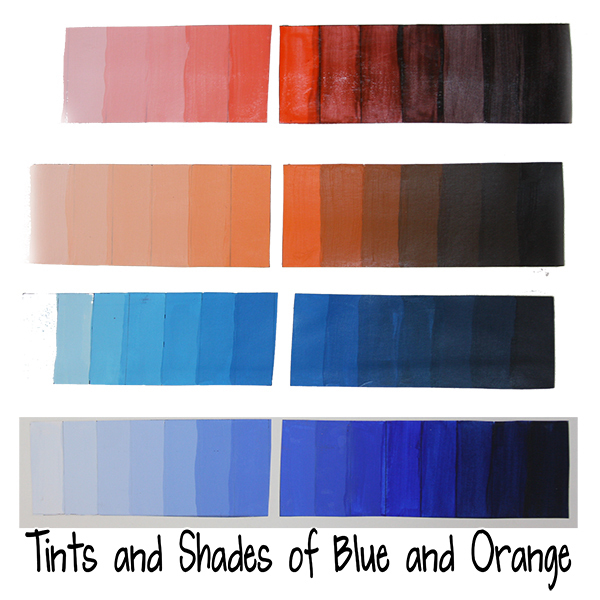 Below is an example of simply adding white or black acrylic paint to Orange, Yellow Orange, Blue, and Blue Violet to make tints and shades. This is one way to lighten and darken your colors, although it does look flat and a bit lifeless. 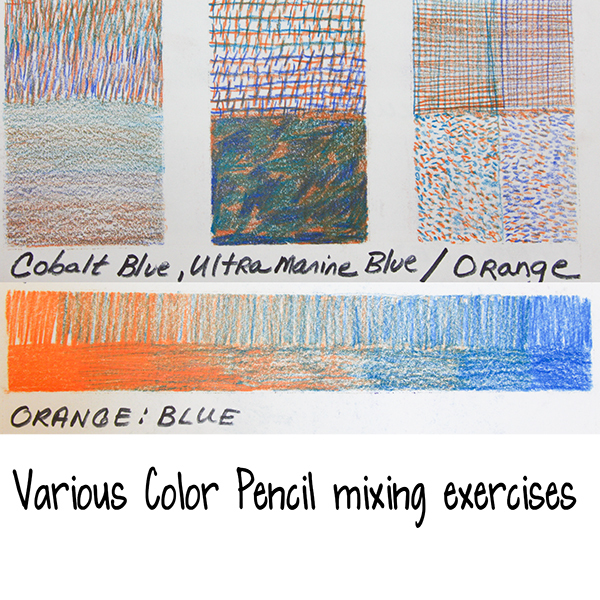 Here’s another example of various blue colored pencils layered over complementary orange in a cross hatch pattern, then whites, grays for tones, and blacks. With acrylic paint and most markers it is almost instant and mostly opaque, although with pencil and watercolor it will take applying layers to get color mixing that isn’t completely transparent. Here’s an interesting example of both blue and orange painted papers of different types, and paint chips and magazine cuts. 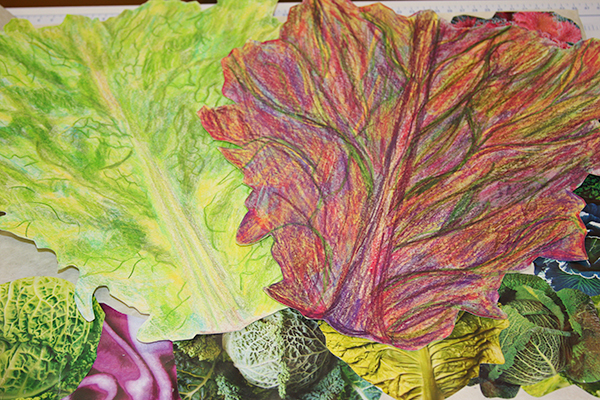 Look at the vibrancy and life of the blue paper chips on the left vs. the right side. 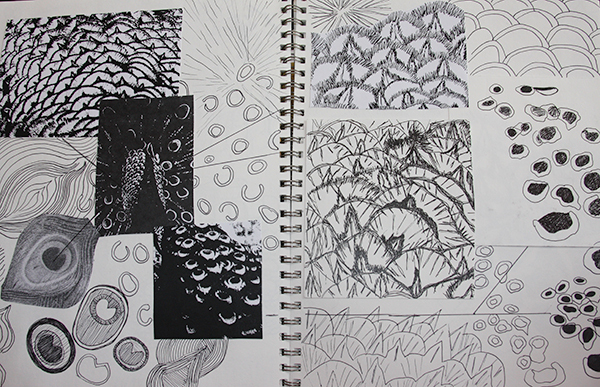 The next two photos below are from my media sketchbook. 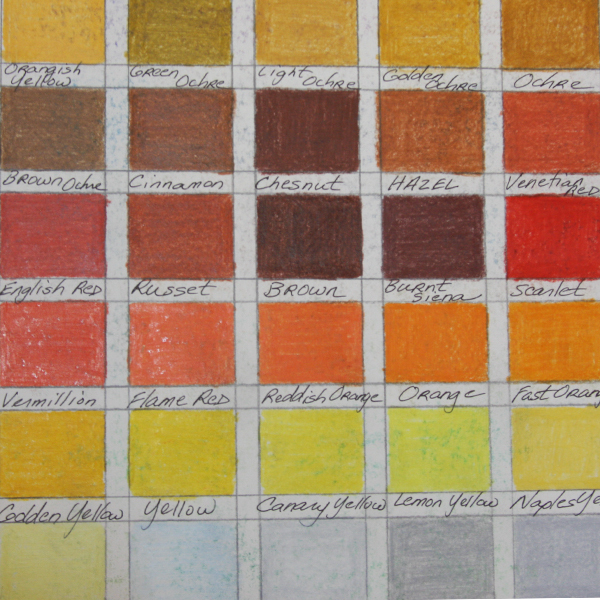 I make color logs of every pencil, paint, ink, marker, or other art material I have, mostly to learn the qualities of the material and how it behaves, but also as a future reference. 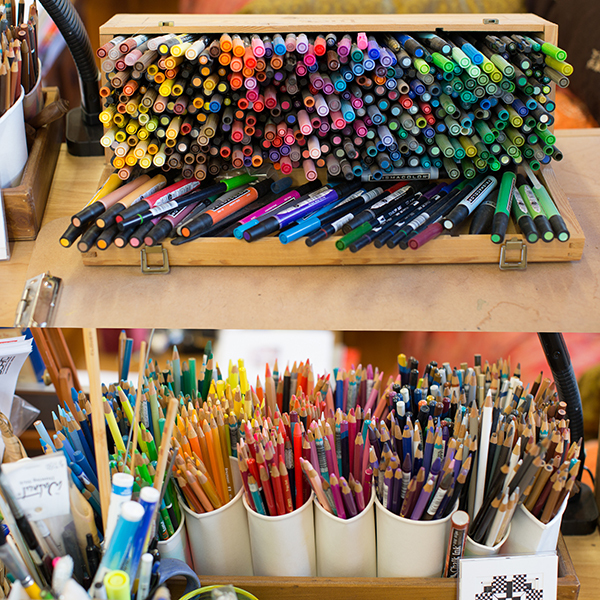 I used drafting tape for the paint samples, and drew pencil lines in a sketchbook as I grouped the pencils, inks, or whatever by color family. 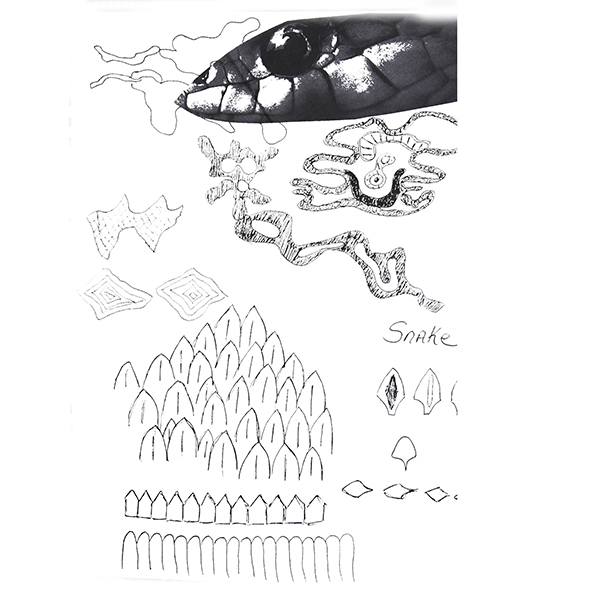 I highly recommend taking the time to do this for at least your main paints and pencils…you will so appreciate how quickly fluency with the media will occur, and the reference book will serve your art process for many years to come. 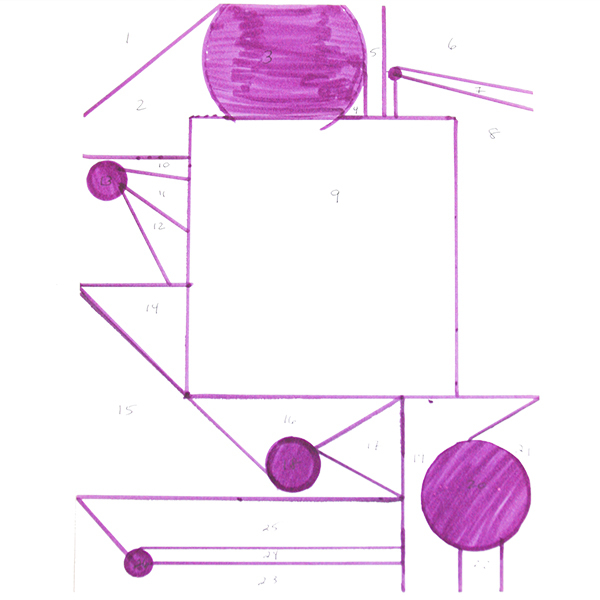 I once did a project during a painting course where I made a geometric abstract schematic, shown below, then cut it up into a numbered pattern to use as a template for cutting painted papers. I learned so much making various color harmonies, including monochromatic and complementary pairs, although the scrappy bits of paper drove me nuts! 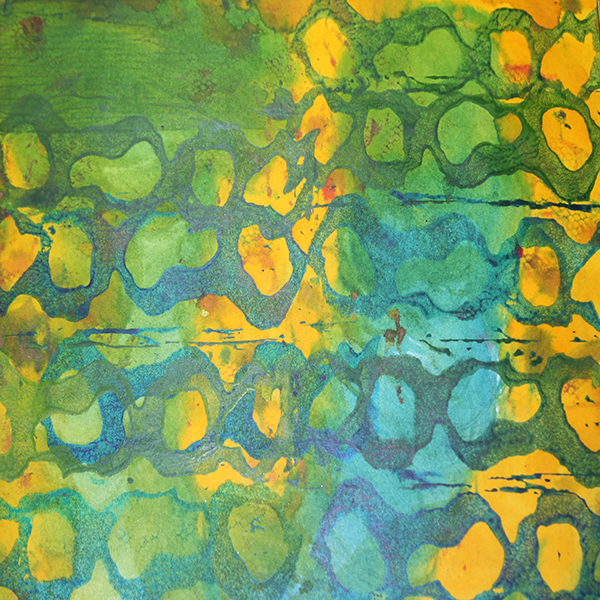 And below, an experiment in layering the two colors. 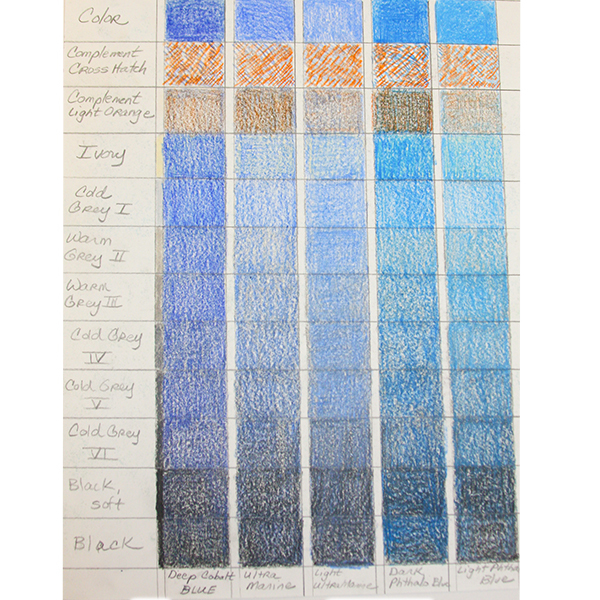 I was unhappy with how forward the orange became, despite using very little…another great learning of how SMALL an amount of orange or yellow to use if the complementary pairs will not be thoroughly mixed together to form another color. I eventually painted over the pages with a strong ultramarine blue! Much happier. 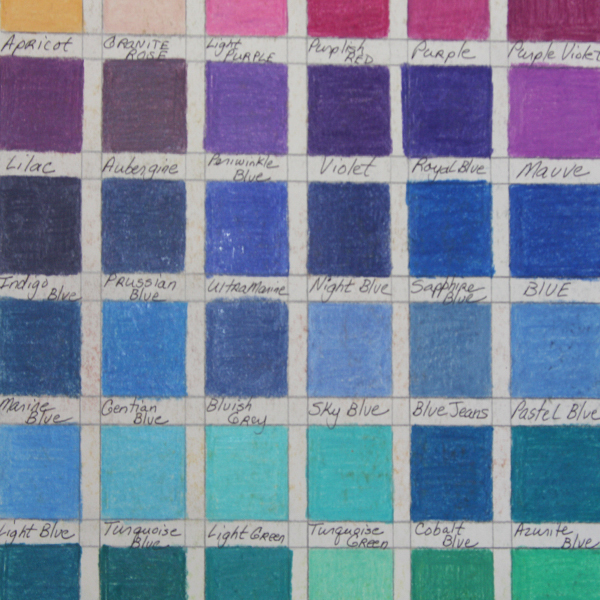 Total color mixing to produce neutrals or interesting new colors is SO much easier with paints and dyes than pencil, I discovered. 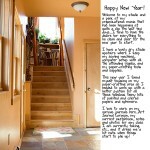 Below are examples of starting at one color and adding 10% more step. 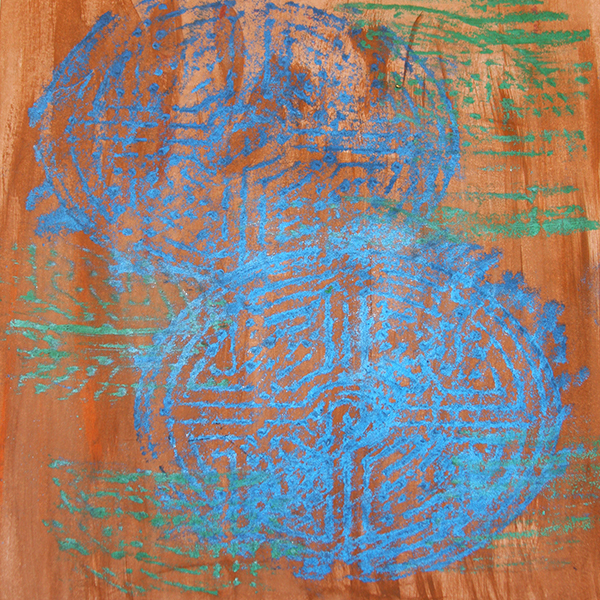 And trying some other acrylic paint combinations with the same type of exercise, less of a percentage with each step. 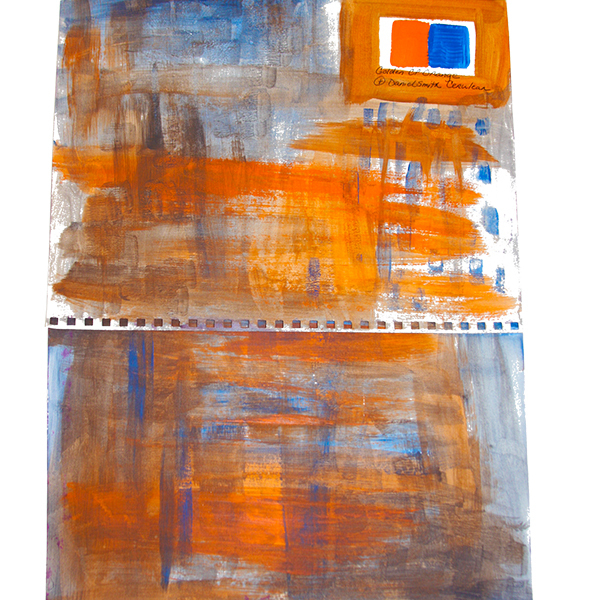 I love, love, love, the earthy, beautiful red-browns possible from mixing orange and blue! Are you excited??? 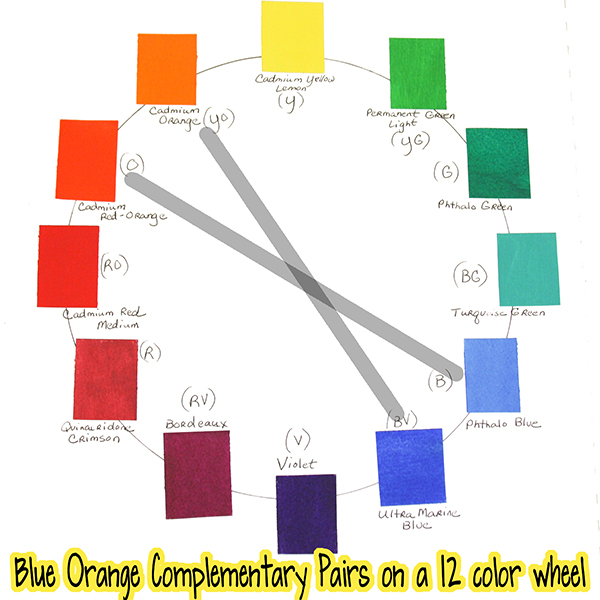 In part 2 of the Blue/Orange complementary pair, I will look at some paper and fabric pieces that illustrate this color pair. I hope you find some time to play with your art materials! 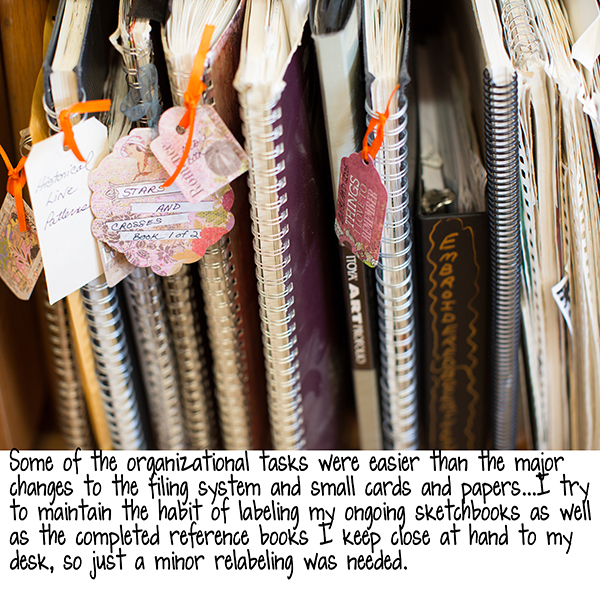 Lesson One 2014 Organizational Mania! 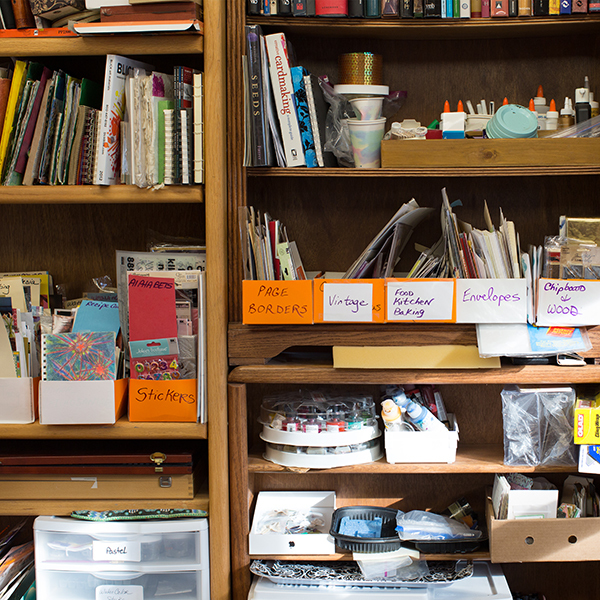 Well, I hope this was at least a bit inspirational in sorting through your own art space! 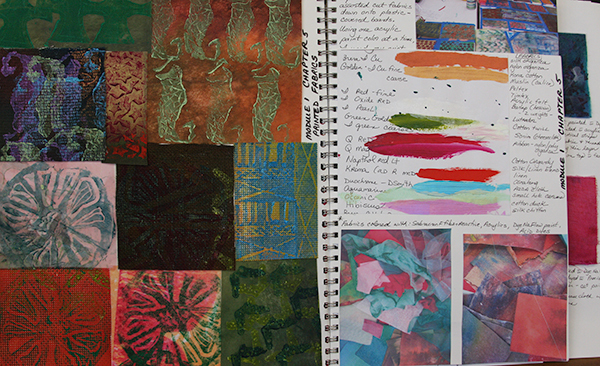 Now I am giving myself the well-earned pleasure of working on the Art Journal Caravan 2014…first day of the year, a new yearly word, another letter to myself, the pleasure of sitting at my desk surrounded by all these wonderful materials just waiting to transform onto the blank page. Happy New Year! With the Winter Solstice fast approaching, my thoughts turn to the longest, darkest night of year and all of the richness present in the shadows. I tend to become entranced this time of year by texture and value scales, appreciating the detail available with a limited color palette in a Colorado winter. I am spending a lot of time with my brand new camera, enjoying the heck out of the vast ISO settings available and the sharpness of focus, but I digress! 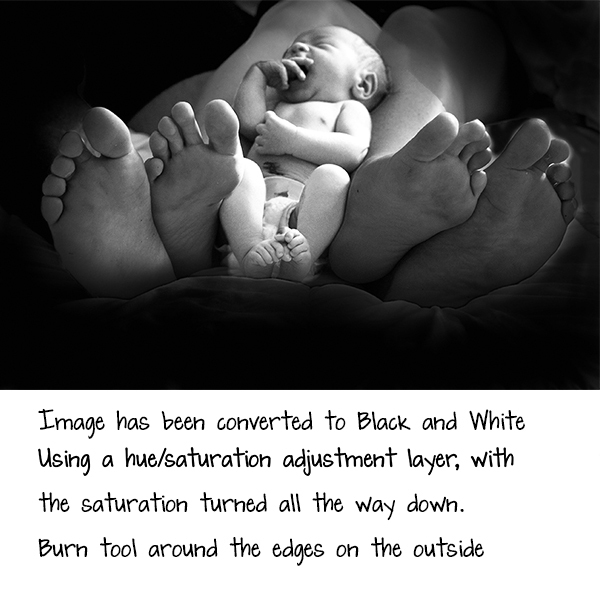 Today I am going to explore various methods of converting a digital image from color to black and white in PhotoshopCS6. I apologize in advance for those of you that use Photoshop Elements, as I don’t know the first thing about the smaller version of PS known as Elements! 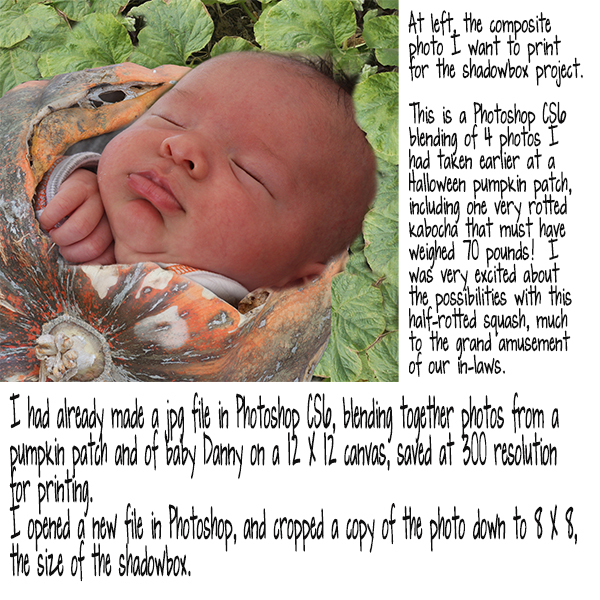 I recently completed a 106 page photobook (insert very tired sigh here!) of our daughter Jessica’s pregnancy and birth of our grandson. 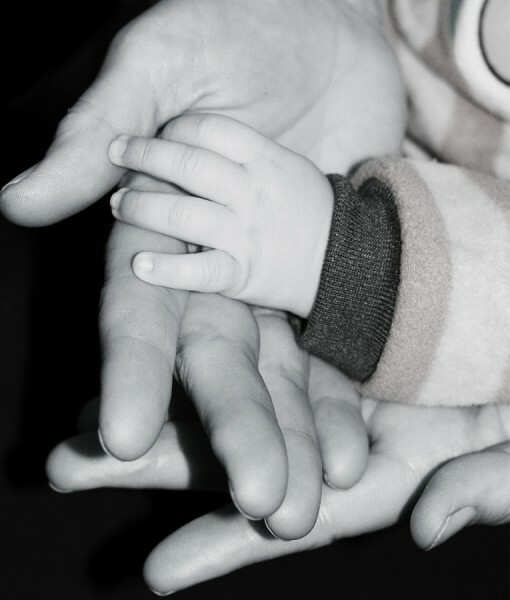 The 7 copies of the book will be distributed as holiday gifts to the extended family of little Danny. In addition, I framed a series of black and white and sepia tone photos for immediate family, and did a lot of studying up on conversion of photos in Photoshop. 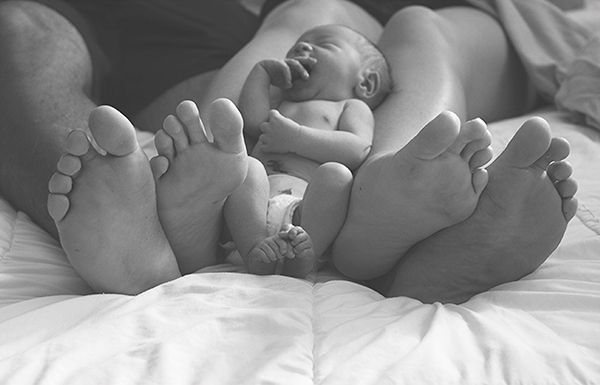 Now, as lovely as this is there are a few issues to my eye: first, the bottoms of Jess and Danny’s feet are assorted colors from living in Hawaii, the baby has a distracting diaper that becomes a focal point since it is one of the lightest values, and the baby’s umbilical cord scab looks like a gash in his belly! Now I added a curves adjustment layer, set to Soft Light in the blending modes, with the opacity turned down to about 30%. 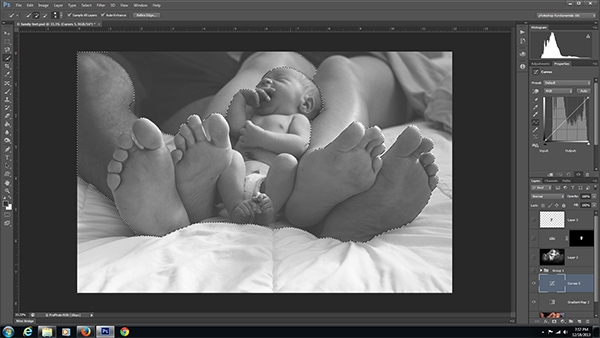 First I selected the baby and added a layer mask to protect the feet and baby’s skin from darkening along with the background. To accomplish this, I clicked on the Curves adjustment layer, then I selected the skin areas with the Quick Selection Tool, clicked on the layer mask icon at the bottom of the layers panel, and hit Control + I to invert the mask to the background. Now I set the blend mode to Soft Light, and increased the shadows by pulling down on the curve. I liked the effect, so I added another Curves adjustment layer, added the same layer mask, and set the blending mode to multiply, with the opacity dropped to about 30% again. As a last step, I added a new layer mask and decreased the brightness of the diaper and patched a bit of brushing over the umbilical area. Yum! The shadows are very rich and the photo printed like a dream. 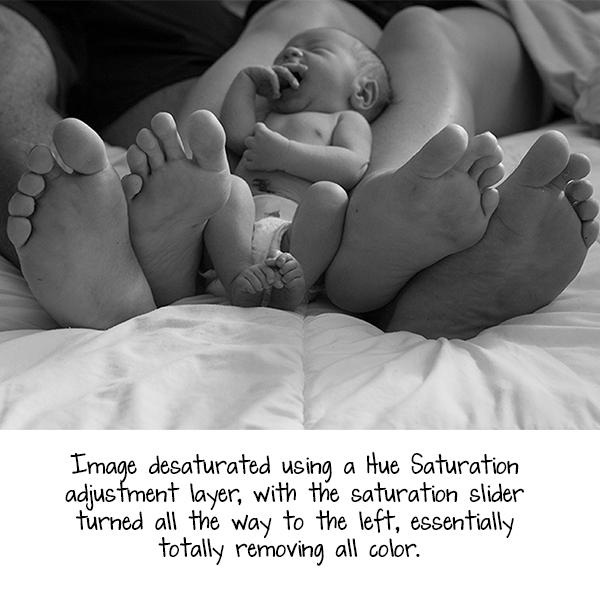 For the photobook, I decided to add a sepia toned layer in the background and on top, with the opacity turned down on the skin areas, mainly to match the overall tone of the book. I like it quite a bit, and printed off a copy to frame. 2. Add a Gradient Map adjustment layer and move the sliders to your taste. 3. Select a Curves adjustment layer, and then using the Quick Selection tool, select any areas of skin that need to be masked off from darkening. 4. 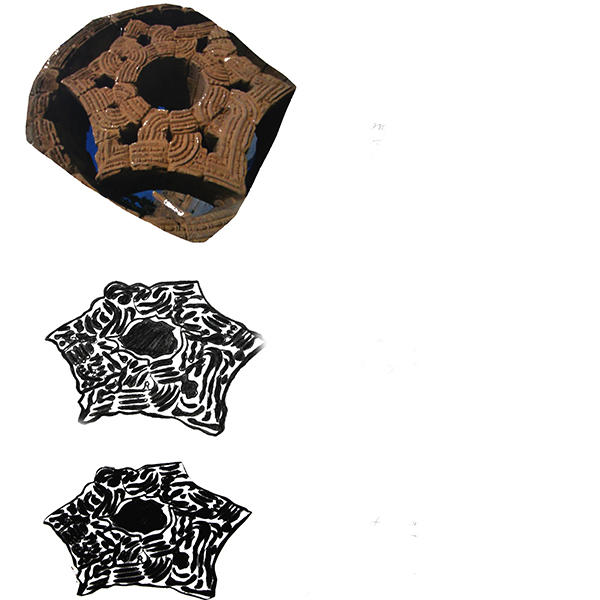 Click on the Layer mask icon, and then invert the mask so all areas affected by the Curves adjustment are NOT skin. 5. 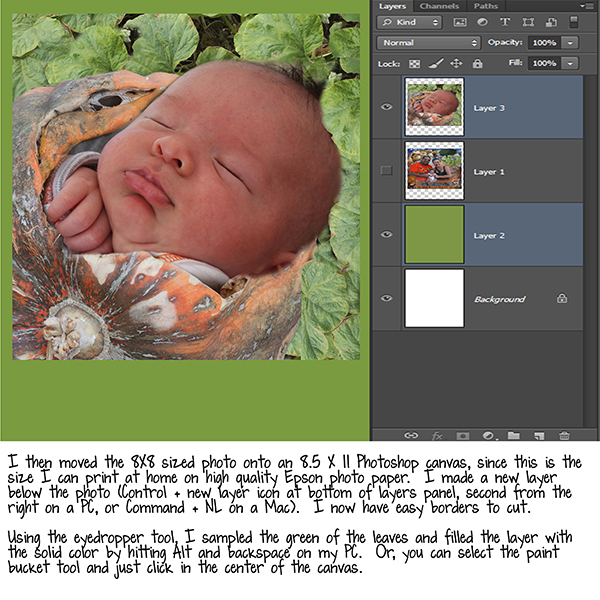 Set the adjustment layer blending mode to Soft Light, and decrease the Opacity to a lower level. Drop the curves line to increase the darks, if desired. 6. AND/OR add a Curves adjustment layer and set the blending mode to Multiply for stronger contrast, remembering to drop the opacity down. 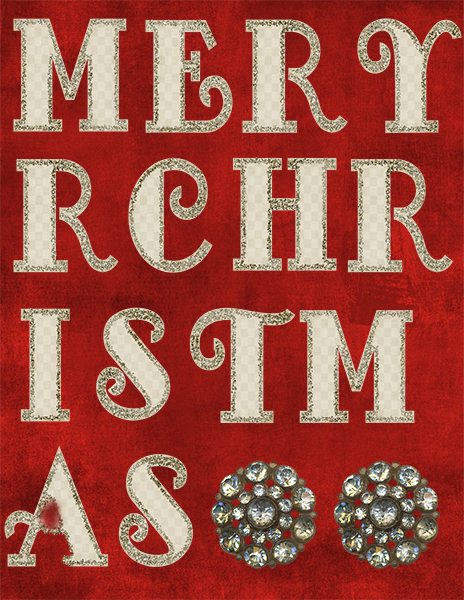 Again, a happy, healthy, and safe holiday season to all! 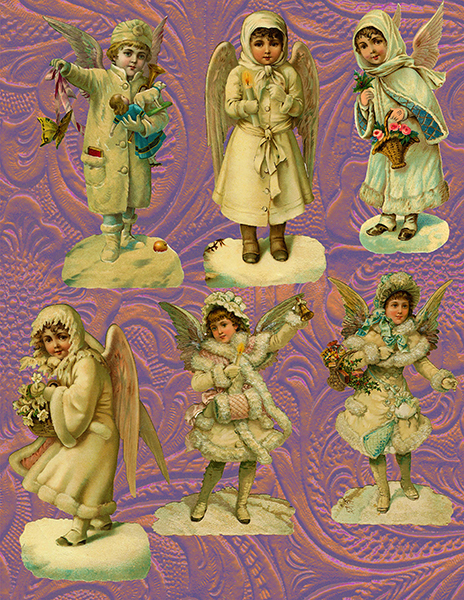 During the month of December I am very blessed to receive many lovely cards that are handmade small pieces of art. 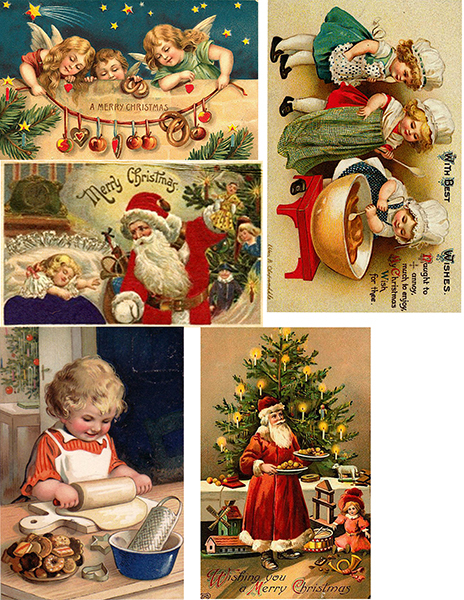 I save most of these and make card banners to display during the holiday season as an easy and beautiful decoration for our home. 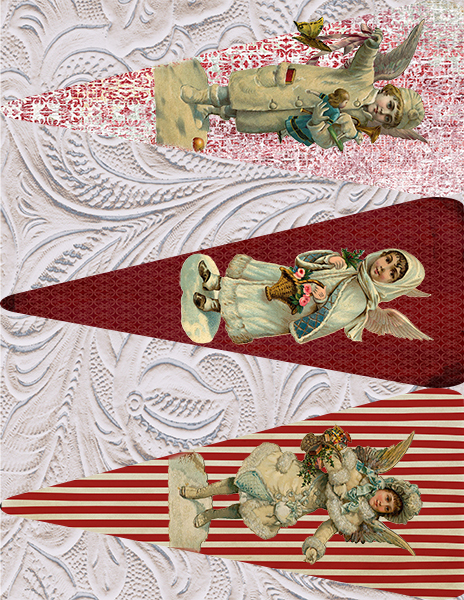 This year, I have been making banners on lace using Tangie’s Winter Wonderland, AJC13 December Collection Scandinavia, and Favorite Things: Baking kits. 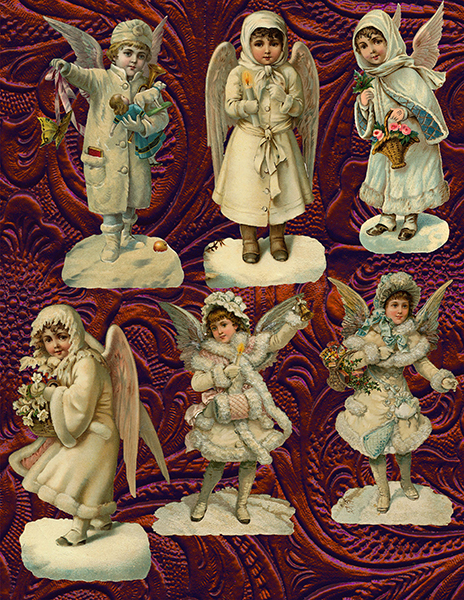 I have been making collage sheets as jpg files in Photoshop using an 8.5 X 11 canvas so that I can print at home, then cutting things up and making the banners using holiday themed brads and applique’ pins. For the triangular shaped pieces, I made a Photoshop template using the Custom Shape Tool, choosing one of the default shapes from the drop down menu. 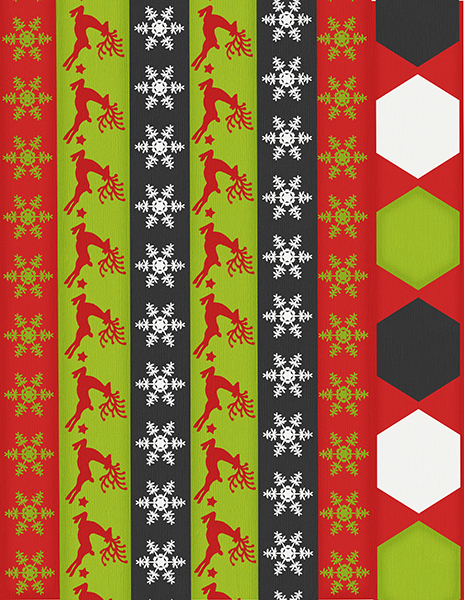 I re-sized the shapes, colored each in black, then used each one as a clipping mask for Tangie’s papers and holiday elements. After I had each mask completed, I added a background paper. 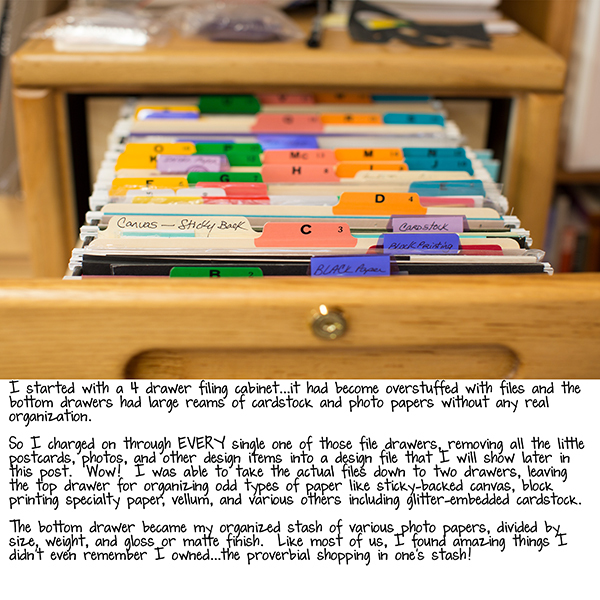 Then I printed the jpg file onto photo paper and cut out the individual letters. 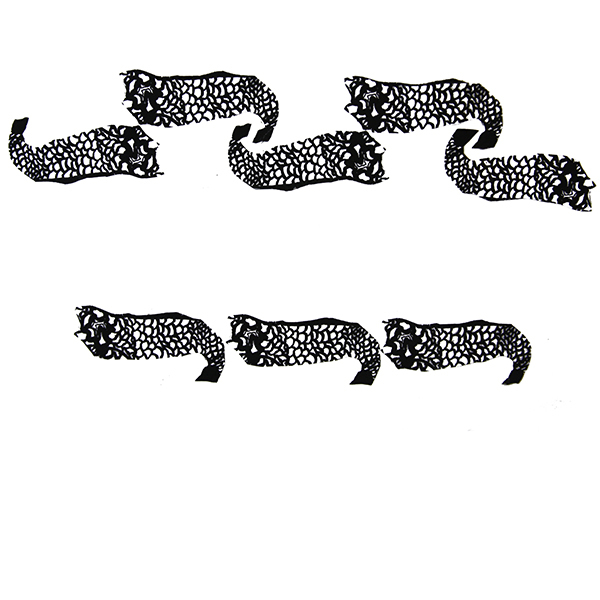 I have started to line up all the letters and mount on a lace ribbon in preparation for my evergreen swag. 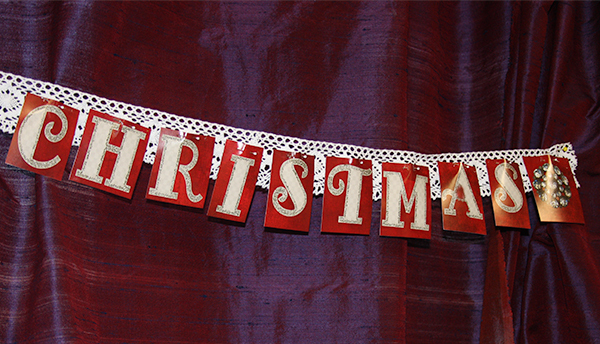 I like to wait until just before the holiday so the evergreen stays fresh and fragrant, so for now, it is pinned to my studio curtains! 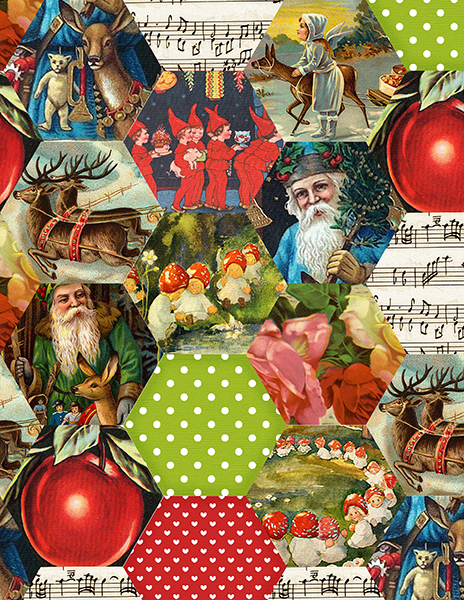 I hope you are all enjoying the wonders of the season, and having a bit of time for some art! This last week here in Colorado we were hit with a massive blizzard that seemed like it was trying to make up for the lack of November snow all in one go! 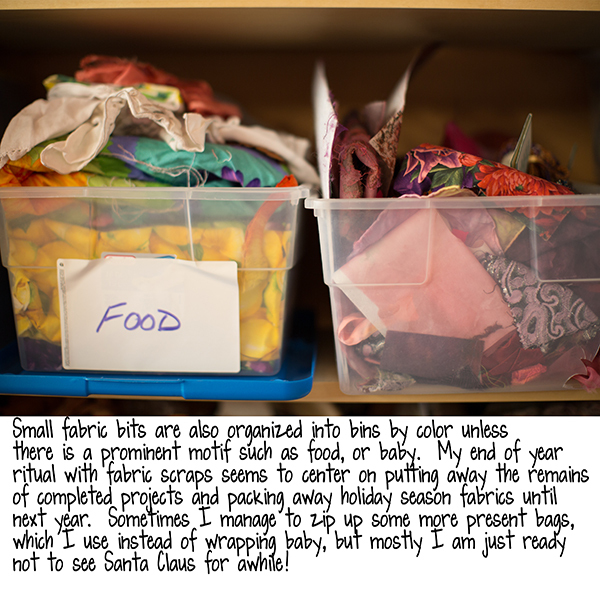 I lost my internet so here is last week’s blog post, then on to this week’s. 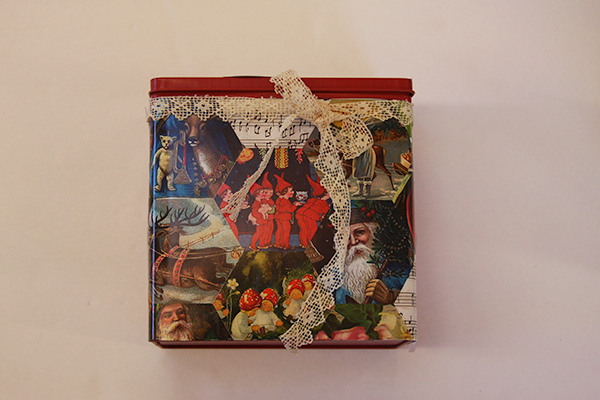 Every holiday season I make lots of sweet and savory treat gifts and decorate tins and boxes for festive packaging. 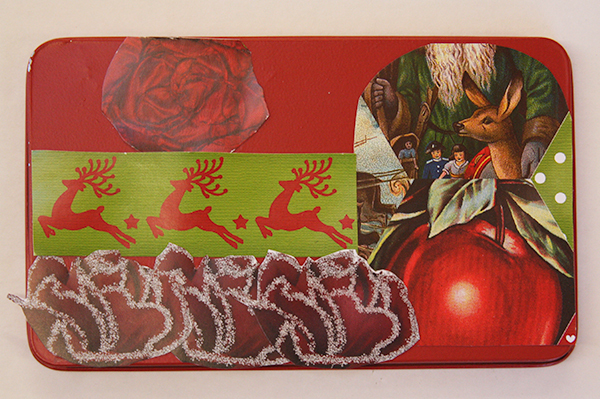 Tangie’s December Art Journal Caravan Collection Scandinavia is filled with fabulous holiday motifs. I made some “collage” sheets of various bits from the Scandinavia collection in an 8.5 X 11 format so I could print the sheets at home. 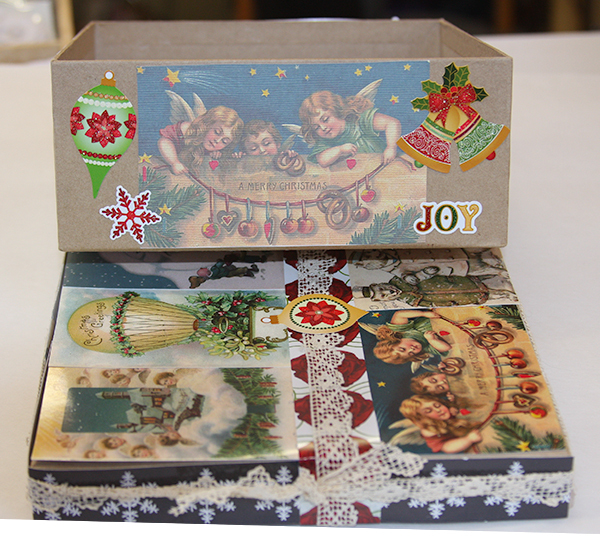 I printed on matte photo paper, adhesive backed canvas, and adhesive backed cardstock to make a stash of holiday items to make the boxes and tins. 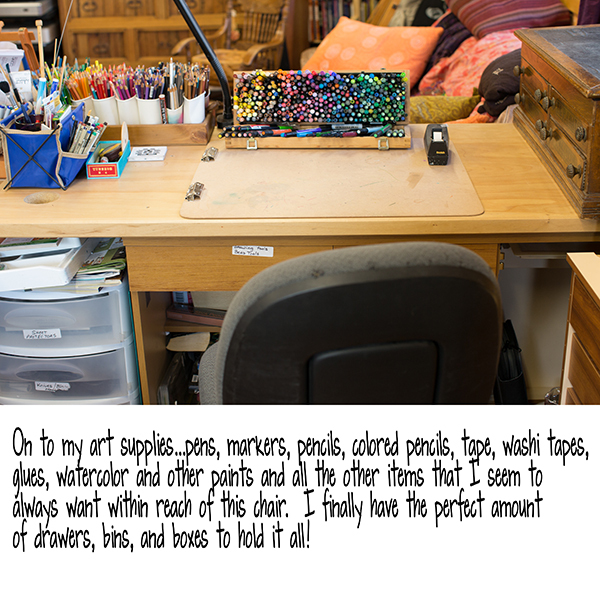 I tend to make a grand mess, make lots of projects over some days, then do a big clean-up all at once…I think this is pretty common to all artists this time of year! If you have a better system, please share! I wish I would find the time to have all my holidays lined up by December 1st, so I guess that stays on my “probably never in this lifetime” list. 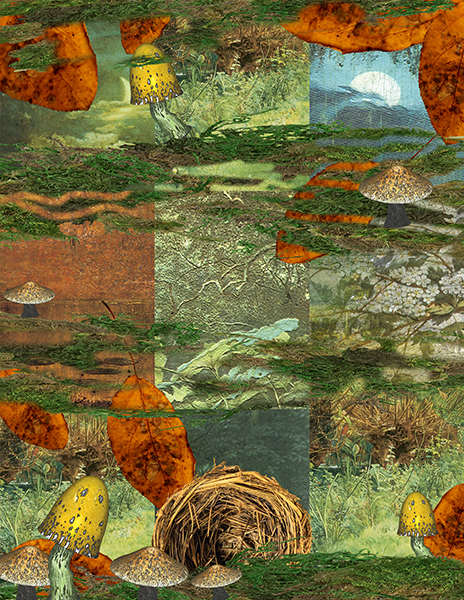 Some of the collage sheets are one element, copied and pasted onto an 8.5 X 11 Photoshop canvas, then I selected one row, and continued to copy and past. 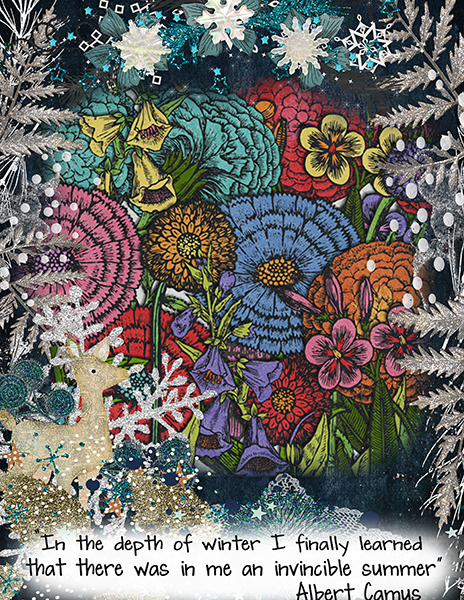 I re-sized the flowers and some of the cards to fit nicely onto the canvas, knowing I would be cutting each element out. 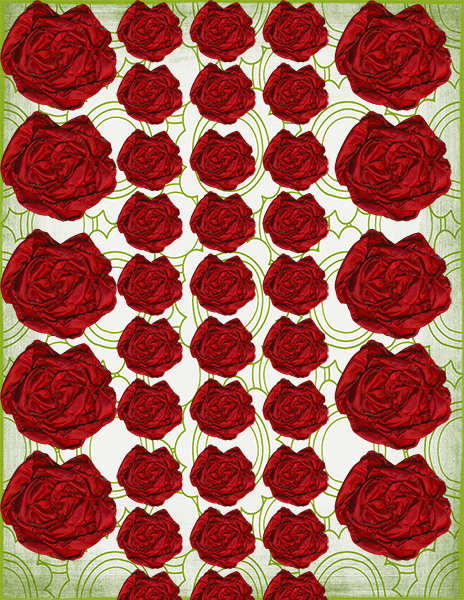 Once I had the roses or other items onto the canvas, I used “Control + New Layer” (Mac: Command + New Layer) so the new layer was below the elements. 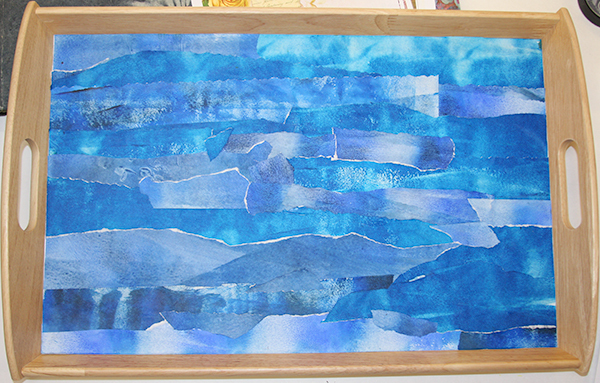 Then I added a background paper to make it easy to cut without a lot of fuss for the elements that had uneven edges. Having said that, I spent a lot of time fussy cutting flowers! 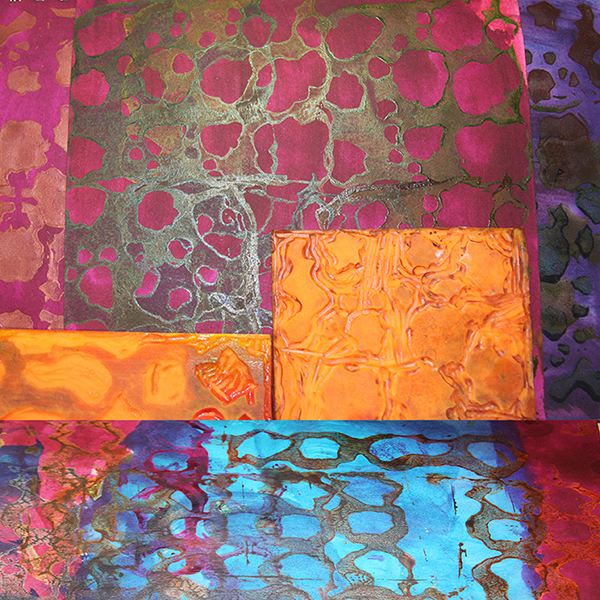 For the hexagons, I started in the center of the canvas, and kept adding to the edges, lining each up like a quilt. On the edges, I placed a hexagon in the space, then selected the excess with the marquee tool, and deleted, repeating with the same hexagon motif on the opposite side. The borders sheet I kept lining up each one with a bit of overlap, and then printed the sheet onto paper-backed fabric as well as paper so I could cut the strips and use as ribbons on some of my packages. What to put into your box? Cards, clips to hang cards, and FOOD, of course! 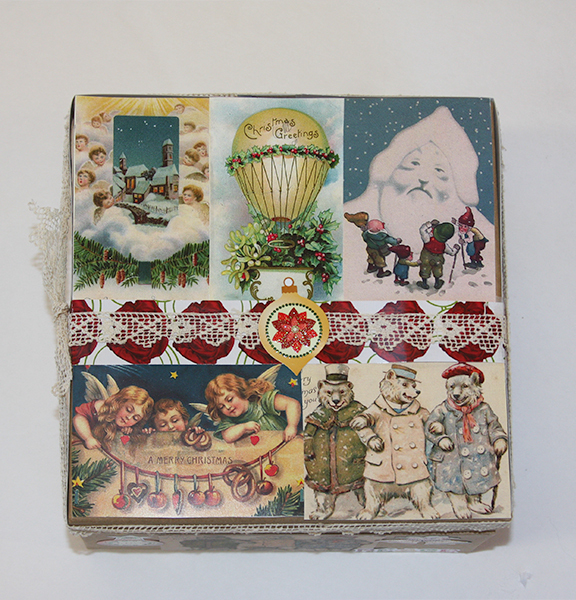 I love to wrap up treats in printed tissue paper with a decorated box, as the box can be used again or for some other purpose by the recipient. *I am horribly allergic to cow dairy except for butter, so I make these with the sheep’s milk equivalent to Parmesan, known as “pecorino”, available at CostCo, or any healthy box store. If I am making a lot of these, I use a grater blade on my food processor, otherwise it is the hand grater and some elbow grease. 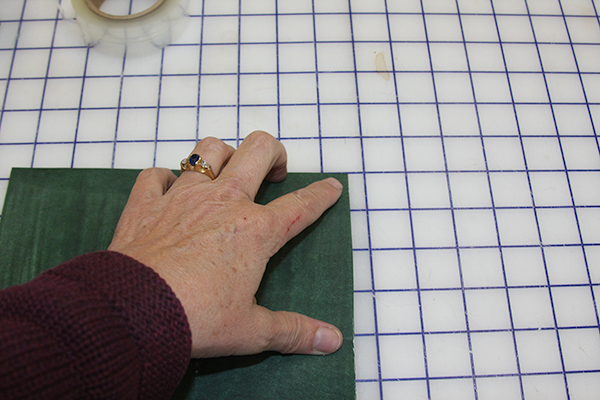 Line cookie sheets, or baking trays with either silpat type matting or parchment paper. Drop 2 or 3 tablespoons of grated cheese roughly into a circle shape. Leave at least 3 inches between each circle of cheese. Bake for 5 or 6 minutes, but stay close! These can turn into “burnt to a crisp” very quickly. Slide the pan liner onto a cooling rack and leave for at least 20 minutes to completely cool. Using a spatula, slide each crisp off the liner and layer with parchment or waxed paper between in a tin or in a plastic bag. *After cooling for a few minutes so the cheese starts to adhere to itself but before it stiffens, the crisps can be shaped by gently placing into a muffin tin or clean egg carton to cool completely. The crisp will form a “nest” type pocket. I often give this gift with my rather famous mushroom/onion soup to float on top with some crusty bread. This is my go-to sweet gift using pecans, almonds, pumpkin seeds, or other nuts than peanut. I love peanut brittle, however I don’t always know if someone has a peanut allergy in the family of my intended gift recipient. I love this toffee style of brittle as it does not contain heavy cream or other milk product except butter. Note! This is not meant as a “health food”! Loaded with sugar!! Remember to brush your teeth after eating!! I buy organic corn syrup that is non-gmo, made by Wholesome Sweeteners and granulated sugar from CostCo, organic Succanat also by Wholesome Sweeteners company. Line a 10 X 15 rimmed baking sheet with oil if it is not non-stick. *Stir all of the above ingredients in the saucepan over medium high heat until all of the sugar looks wet. Clip a candy thermometer to the side of the pan with the base into the mixture of ingredients and continue cooking WITHOUT STIRRING until the thermometer reads 310 degrees F. It will be foamy, and tan colored around the edges, and will take at least 15 minutes depending on your elevation. At high elevation like my home, it take around 13 minutes, again, don’t walk away! *Remove from the heat and take the thermometer out of the pan. Whisk in 1 teaspoon baking soda, remembering that it will be very foamy, then 1/2 teaspoon of salt. * Add either 1 1/2 cups nuts and seeds (pecan, peanut, almond, pumpkin, etc) OR 2 teaspoons of spice such as red pepper flakes, ground cardamon, or black pepper. Whisk in your choice of nuts, seeds or spices. *Pour the entire mix onto the prepared baking sheet, tilting it around to spread the “goop” as evenly as possible. Sprinkle a few of the nuts or seeds on the top of the mixture. *Cool absolutely completely and totally on the baking sheet, which will commonly take at least 1-2 hours. Don’t shortcut this step! 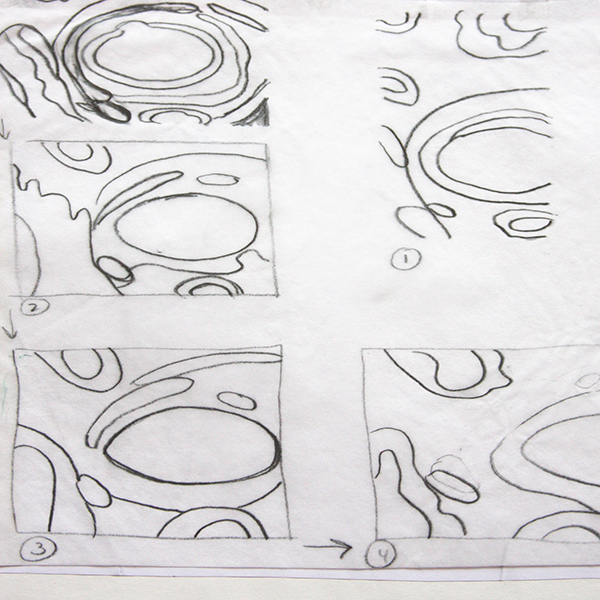 *Invert the sheet over a parchment sheet on the countertop or large cutting board. Gently break up the brittle into small to medium sized pieces. *Package as desired and enjoy! The brittle can be stored in the refrigerator or an airtight container without refrigeration for up to one month. Today I am going to post for both this week and next as 11/27 is the day before Thanksgiving here in the US…our daughter’s family is coming from Hawaii tomorrow to spend the week with us in western Colorado and are all hoping for snow. 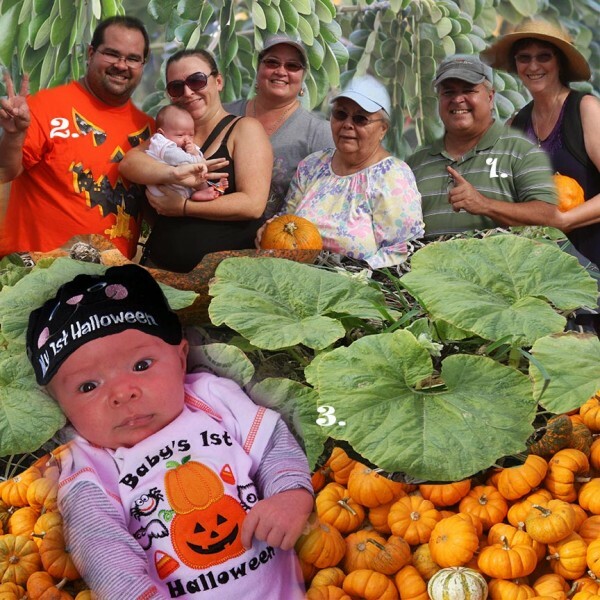 Yes, my sweet almost 2 month old grandson is coming with Mom and Dad for Grandma Rain to take a few thousand more photos of his beautiful baby-ness! Maybe I will recover from overwhelming grandparent mania, by oh, age 18 or so, but then again, maybe not. It will just be another phase. 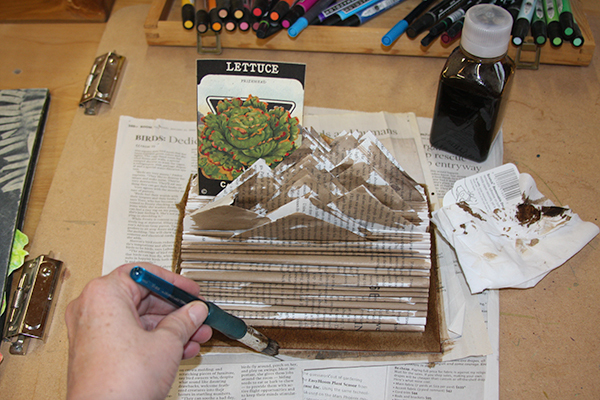 These two lessons are about using a paperback book to make a 3-D card or desk topper. There are so many paperback books available at library and tag sales for practically nothing…I have a small box of books I’ve picked up at the library sales for 5-10 cents, along with some hardbacks to make altered books for less than $1. I occasionally match the topic of the book to the actual card recipient, but more about this later. 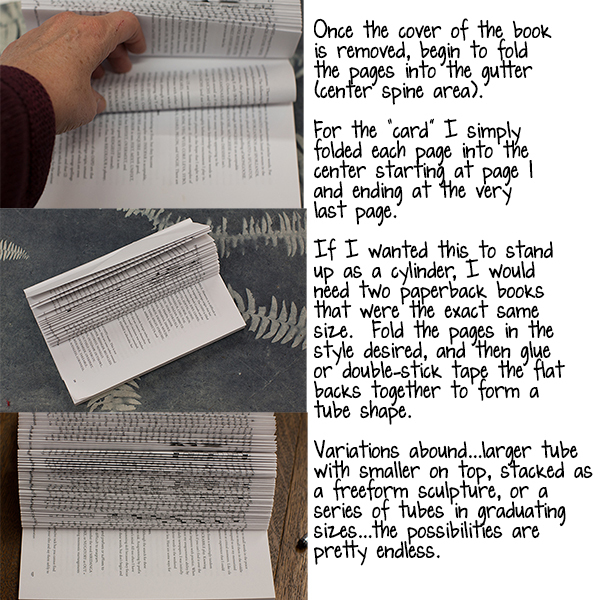 Let’s first look at the mechanics of making the paperback into a card base. This is all about folding. 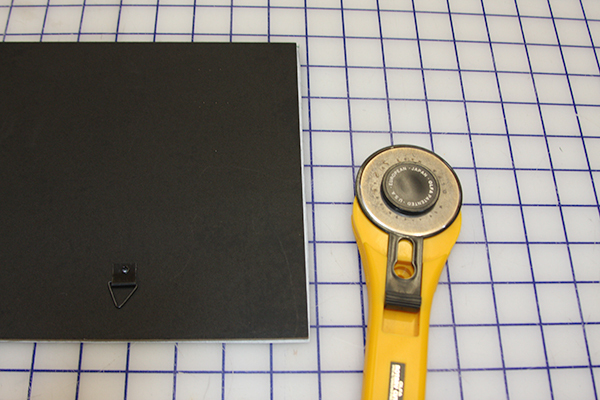 First step, using a craft knife, cut off both the front and back covers of the book. I often save these to use as backing for some of the tidbits I push between the pages later, or you can just toss into your recycling bin. This particular book is about playing Scrabble, and has special meaning for my friend as playing online while receiving chemotherapy infusions has helped her keep her sanity. 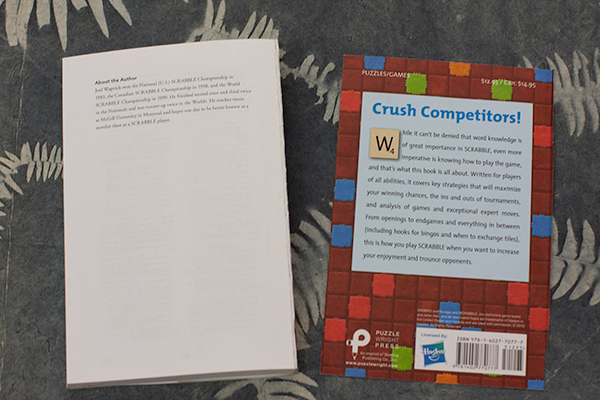 I loved the paper of this book, but honestly it was such a lousy Scrabble guide I had no qualms about tearing the covers off and folding the pages into my card base. 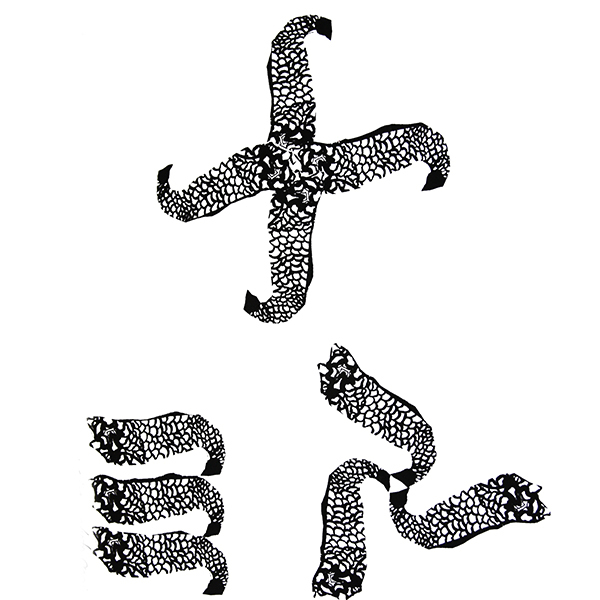 *Cutting and Folding in a stairstep from small to large, then continuing from the peak, folding back to the smallest. 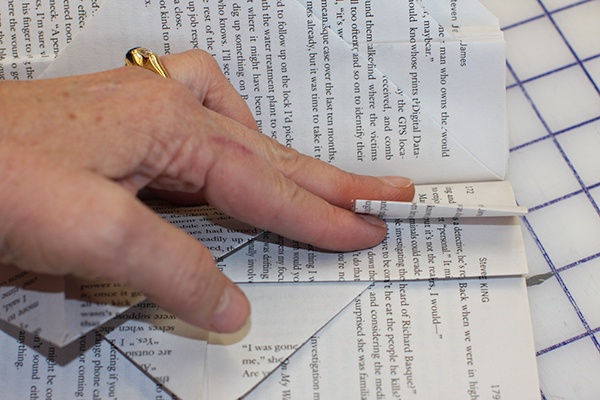 *Folding partial pages into triangles, rectangles, squares, or any other shape desired. The photo of my desk topper above was made by making triangle folds moving from the right, across the middle, to the left, and back in reverse:..I started with a center triangle by folding the outer corner into the center on both sides of the page. 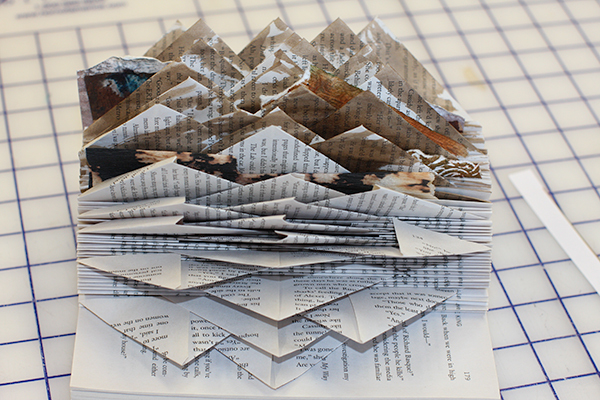 In between each triangular fold, I folded the page in half, towards the center gutter of the spine. The half page folds increase the stability of the overall base. In the photo above, I am showing a center triangle. 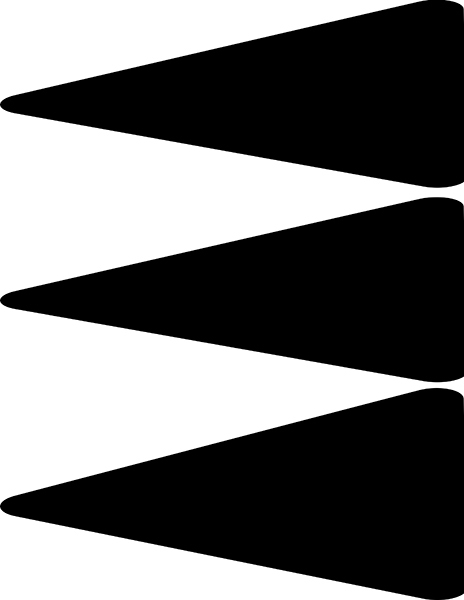 In the image below, my fingers are lifting the small right side folded into the center, while the left bulk portion of the page is folded into a left-sided triangle top. In between are the folded in half pages. For this particular desk topper, I painted Walnut Ink onto the pages in a rather haphazard way…the pages could be sprayed with inks or paints, painted first, or after folding. I have a friend that can’t make anything without glitter glue, so of course, her books are heaped with lines of various colors of glitter. 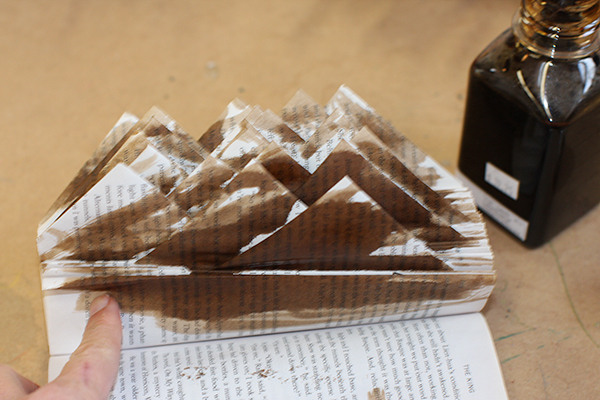 Gesso or other base could be applied to the pages, other pages glued on or stuck in, then sprayed or painted or ? There are a lot of options! 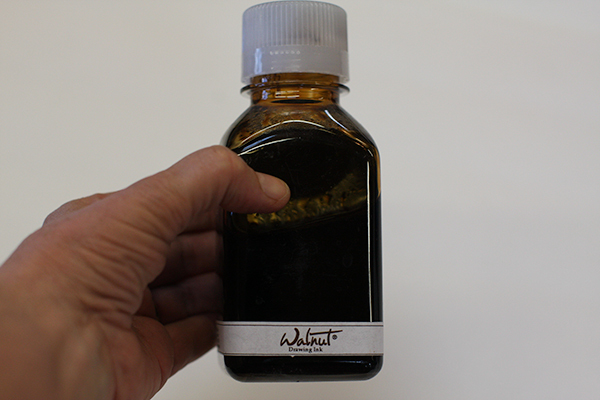 I brushed on Walnut Ink with a basic cheapo brush, going for a mottled look. I actually painted on the ink on the first third and kept on folding, cutting and folding until I reached the peak of the base. Then I folded groups of 6-8 pages in half, then 4 pages, then 10, just random numbers of half folds without triangular tops. 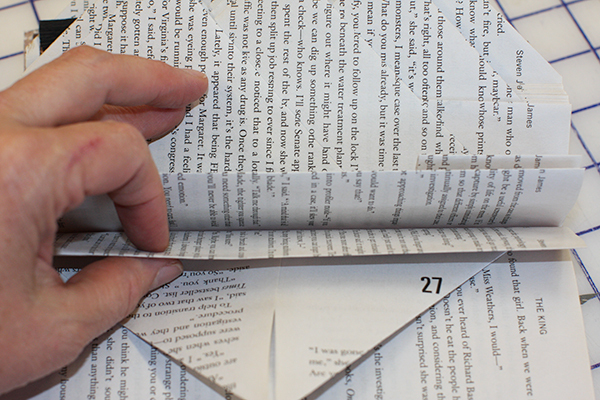 These will hold up the triangles, making it easier to put the bits and pieces in between the pages. 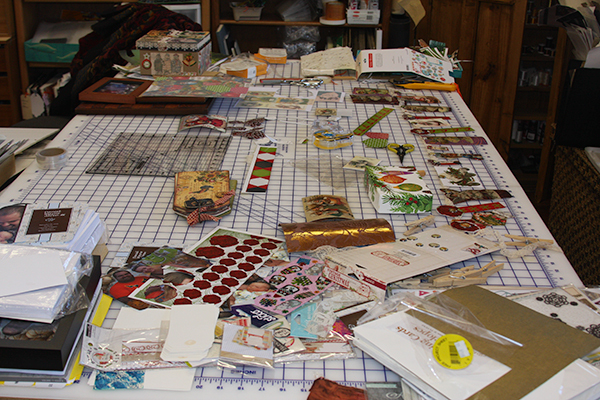 In the image above, I have already started to tuck in pieces of painted, stamped, stenciled papers and cards. 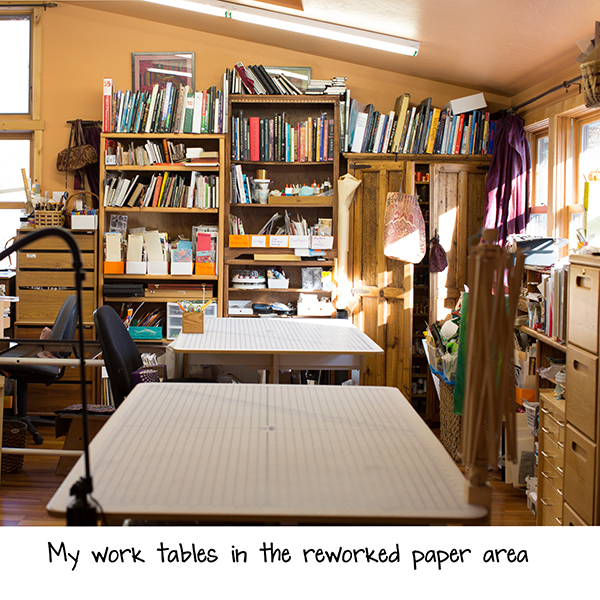 Since my studio desk is over one hundred years old, made by Gary’s grandfather, I am super careful of anything touching the wood surface that isn’t absolutely soft. I made a felt base for the desk topper with a piece of cardboard attached with double-stick carpet tape to craft felt, then trimmed to size. 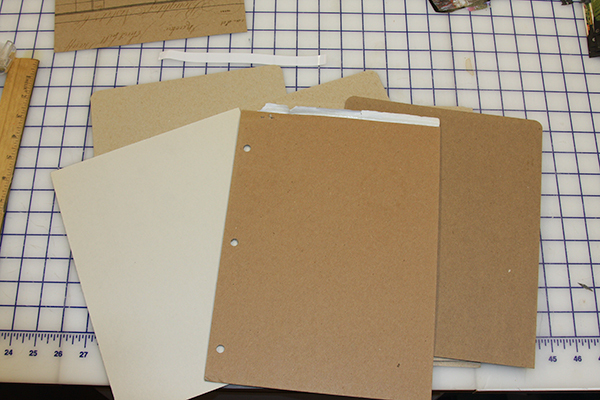 I keep all sorts of card around, backs of sketchbooks, watercolor pads, paper tablets, etc. I love the thin card used to pack shirts or sheets. If I am the least bit concerned about archival quality, I will seal the cardboard with a Golden GAC 100, to prevent acid drift. 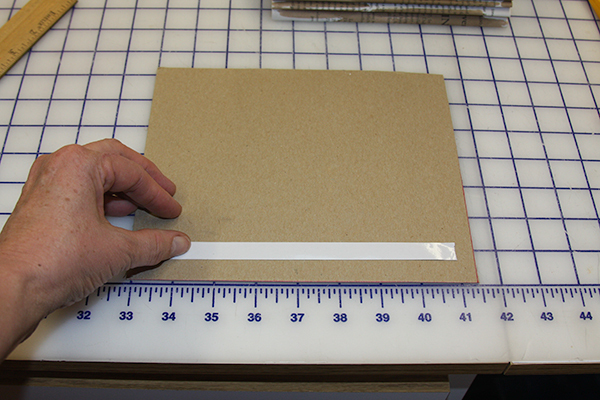 I attach the base of the paperback book to the cardboard using either double-stick carpet tape or some type of glue. Once the base is adhered to the cardboard/felt base, I paint on Walnut Ink all around the visible area. 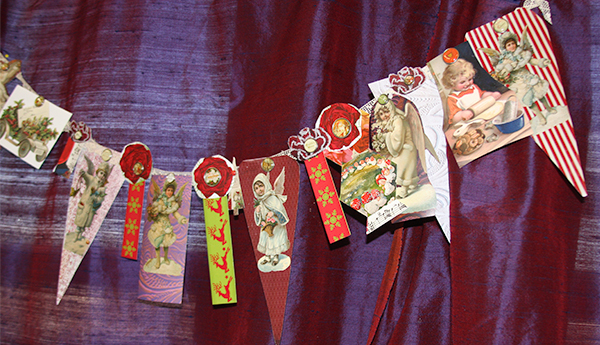 Obviously, there are so many different ways I could choose to decorate the folded pages! 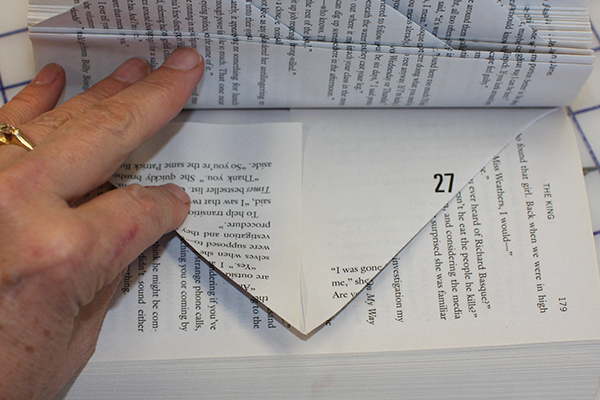 Or, just leave the pages alone and just fold. The card for my friend battling illness is a Scrabble book, kind of a joke between us about 7 letter Bingo plays, and I wanted the pages to be visible. 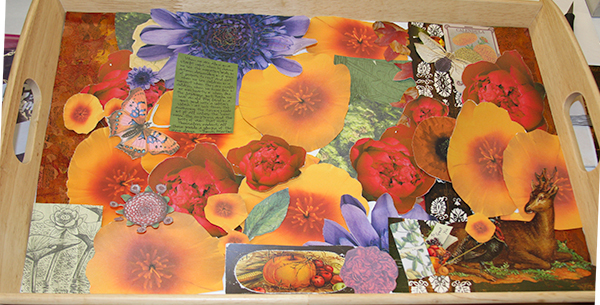 In the next lesson I will show you some different types of insertions, including floral wire, seed packets, notes and journal cards, word poems, etc. 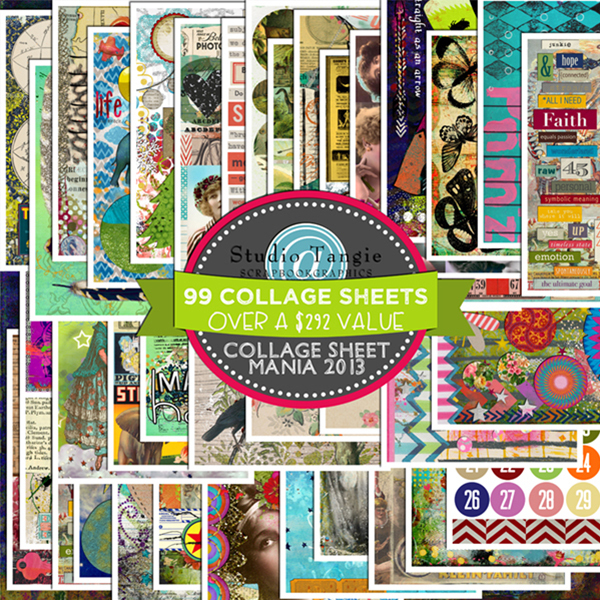 Once again, I am so totally in love with Tangie’s Collage Sheet collections for so many reasons, and for this particular project, the printed sheets are an easy and fun way to give a set of variations as a gift with the card base. 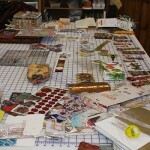 I tend to print off a batch of collage sheets, my own art journal layouts, photos, or other pages, and keep a stack by the computer or TV or anywhere that time is spent listening to a video or tutorial. 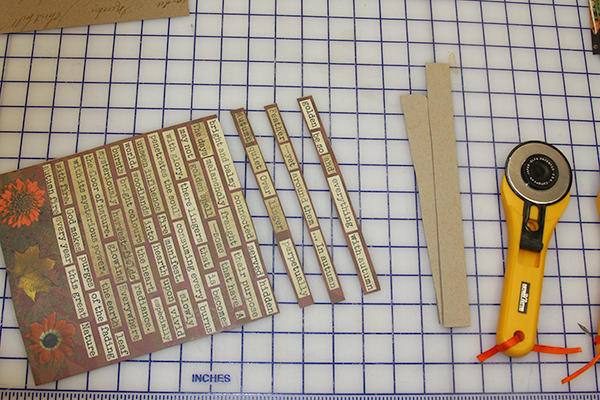 I cut out bits and keep them all in a tray for the next project, many times first fusing the printed sheet to another paper or thin index paper or cardstock to stiffen, as this makes fussy cutting so much easier. 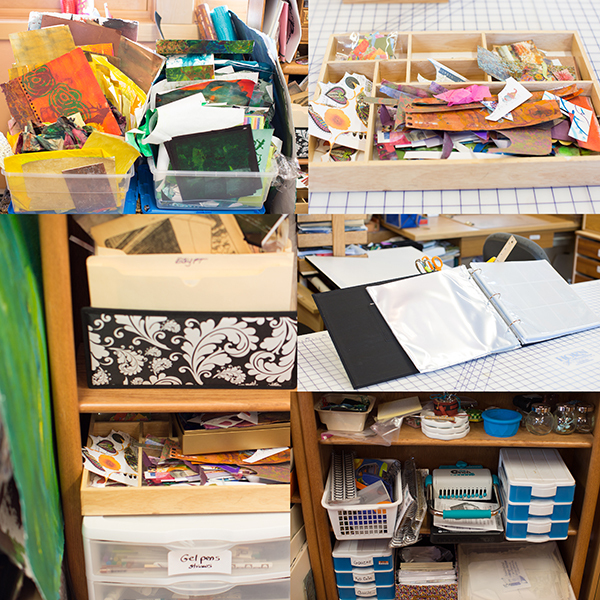 I also keep paper edge trimmings, little squares of card, photo trimmings, and other edge bits in a box as possible “attachments” for my collage pieces. 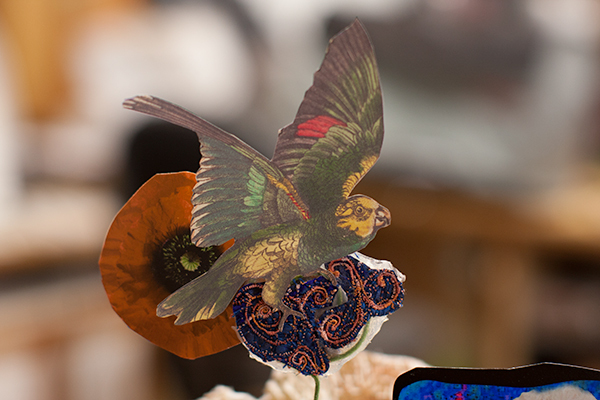 Sometimes I glue, sometimes I use double-sided tape, or even permanent soft gel medium, to attach the printed cutout to the floral wire or card. I have a lot of covered floral wire from some mythical project lost in the mists of the past that I love to use for this type of insert as I can bend and bend over and over again without breaking the wire. I often attach little stitch samples leftover from a project, or a City and Guilds sample set, or whatever, and attach it to the floral wire with Golden High Gloss gel medium, Soft or Hard Gel, laid out flat to fully dry over at least 24 hours. 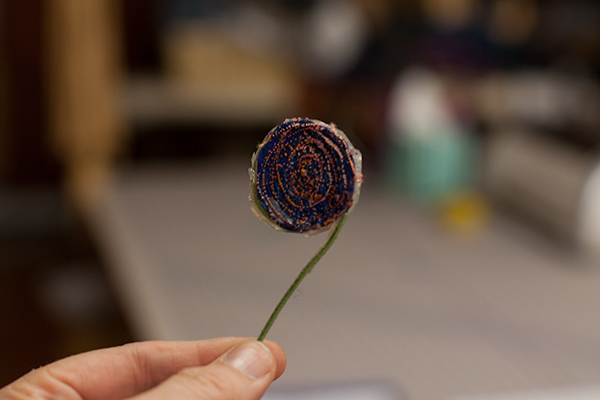 The first image below is the front piece of free motion stitching on a piece of blue dupioni silk, glued to a spiraled floral wire. 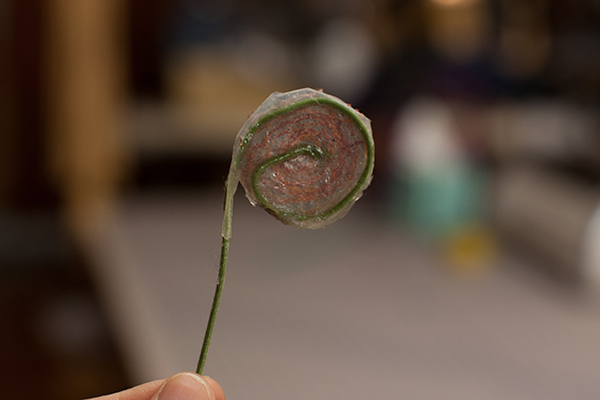 The second image is the dried Hard Gel. 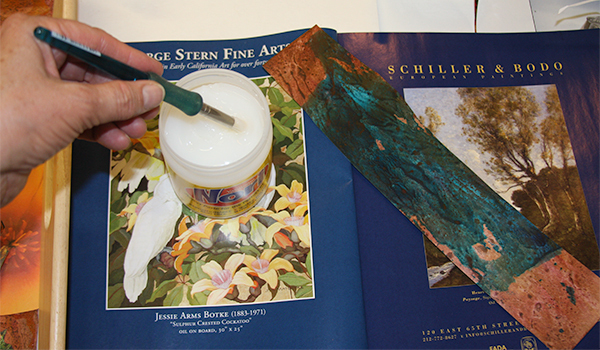 Once dry, all the Golden gel mediums can be cut or trimmed with a scissor. 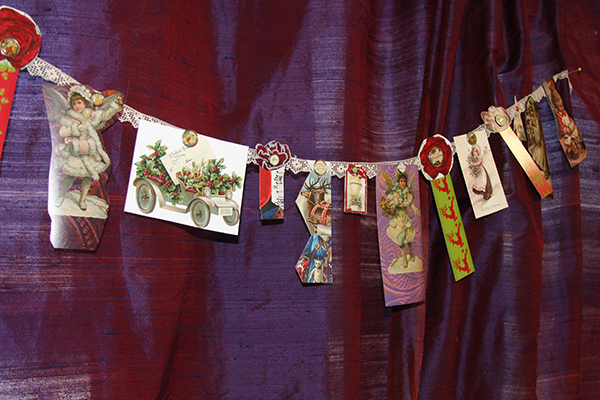 Below is an image from my friend’s card, where I have glued a batch of bits together. The wire or card or other bottom portion is tucked right between the folded book pages, and voila’, instant interactive card. I have a large and wonderful base that I use to organize which seeds I will plant next in my greenhouse this time of year. I found this paper from a now defunct shop in Colorado of vintage seed packets and decided to fuse each one to cardboard as spacers for my large seed collection. 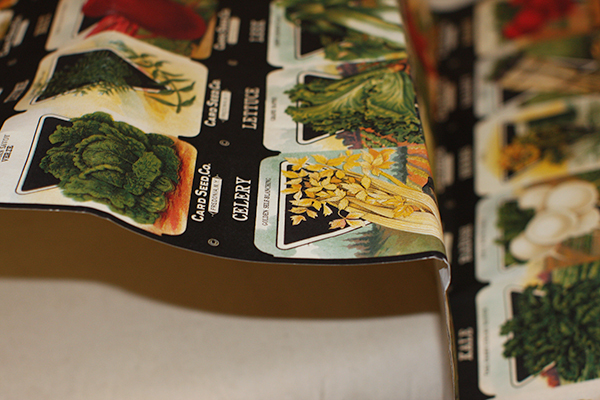 Once late fall arrives, I like to stick one or two into a base book with the seeds so I remember to go toss a few rows into the greenhouse beds for winter eating. In the spring, I would need a table top for all the varieties that I plant! Now, not so much, so the art work is a much appreciated reminder of all the gifts that gardening brings to my soul. 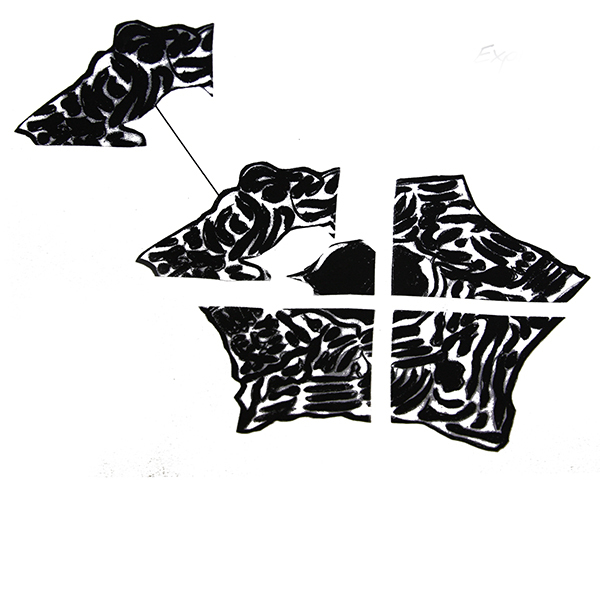 The paper had been crushed and rolled badly, so first I pressed the back with a dry iron to take out some of the crinkles, then fused Wonder Under two-sided glue to the back. 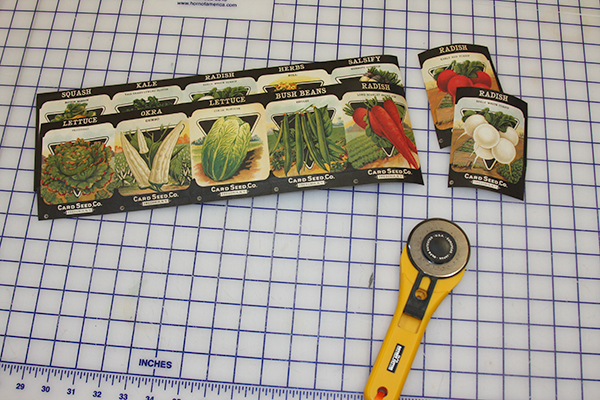 Once the fusible cooled off, I used a rotary cutter to slice through each row, then each individual packet. 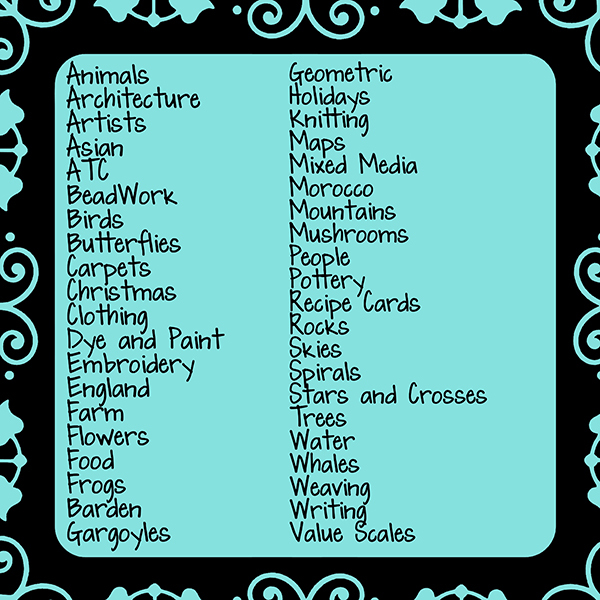 Some of these I fused to card, others to scrapbook or Kraft paper. 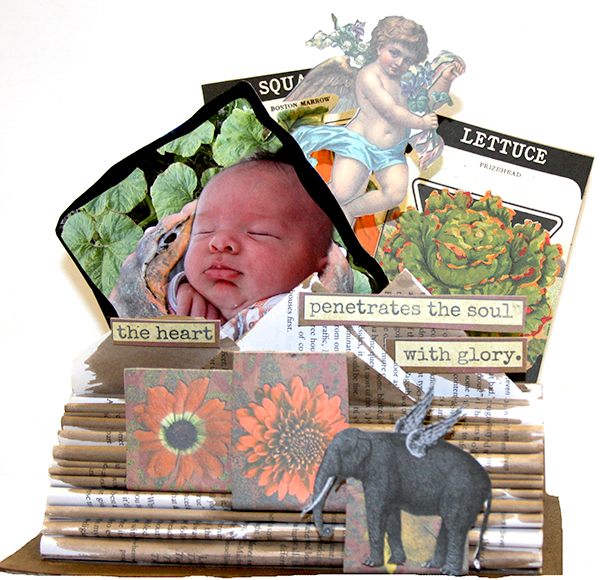 Word Art is another fabulously fun option for an insert. 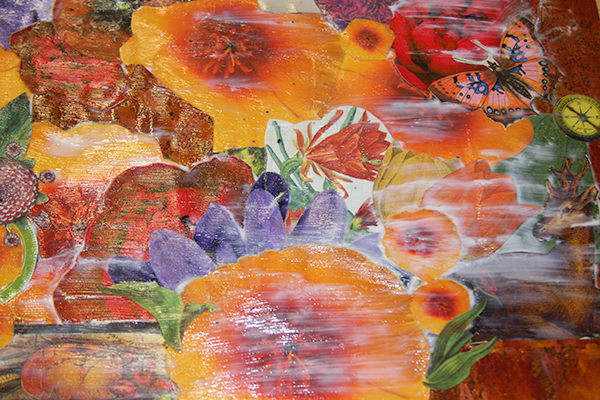 Here is an image of another collage sheet of Tangie’s from the latest collection that I fused to Wonder Under, then after peeling off the backing paper, fused to a piece of thin card. 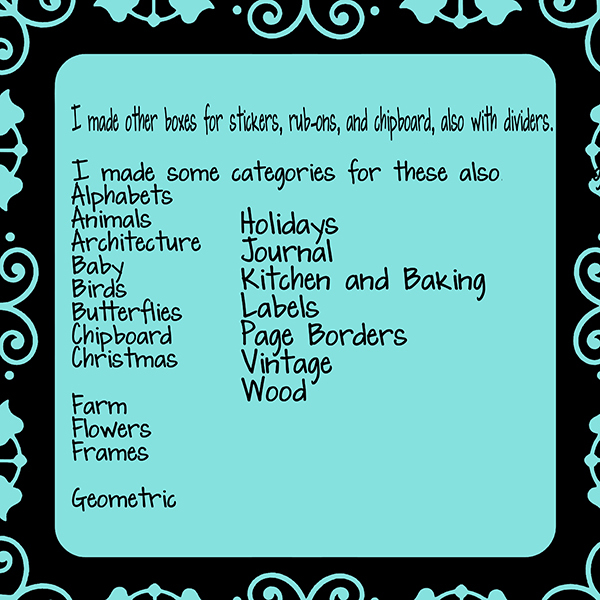 I used the rotary cutter to cut between the lines, then either rotary cutter or scissors to separate the words. 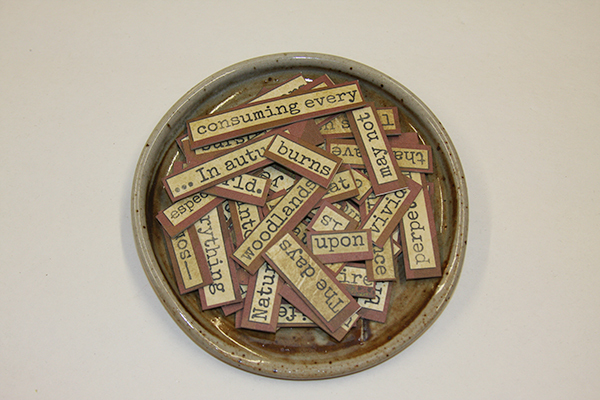 I keep a bowl of words on my desk and make little poems, affirmations, card greetings, or whatever with them. Sometimes I just line up words on my desk then sweep all back into the bowl. 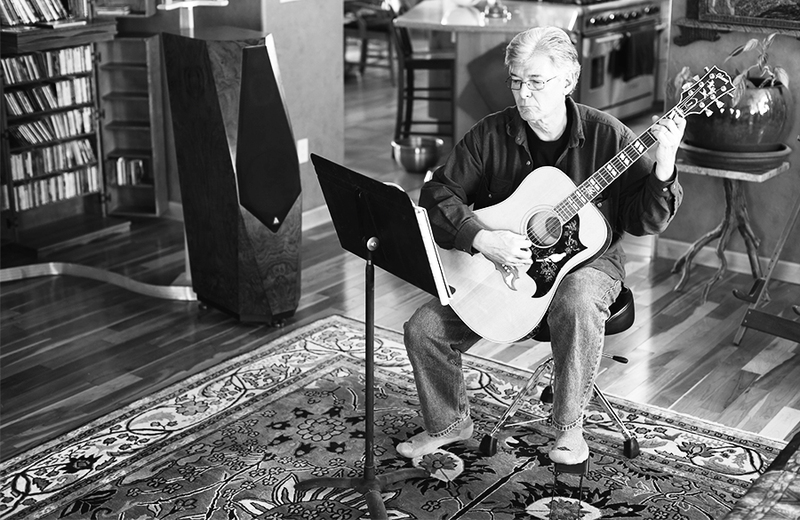 I wish to you all a very safe and happy Thanksgiving…this holiday is always about gratitude for me. I feel so blessed on every level of my being, and I thank God for a long list every day. 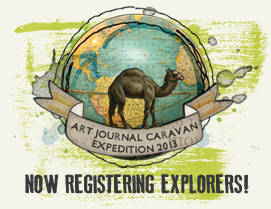 This month in my art journal I have been celebrating this incredible community of artists, the Art Journal Caravan, and our very own Tangie Baxter. So for all of you, I hope there are some moments in this holiday season to make art, to express yourself in color and form, even if just for a few moments here and there. The weather in Colorado has been magical this last week with days in the low 60′s and colder, crisp nights. The heirloom apples from a neighboring organic farm have been so delicious, and the big quandary is simply which variety of the 7 or 8 in the root cellar should we eat next. I love this time between Halloween and Thanksgiving as it feels truly like fall, with all the sights, sounds, and flavors of the season. Winter starts for me after Thanksgiving, despite the date on the calendar or the weeks until the winter Solstice. 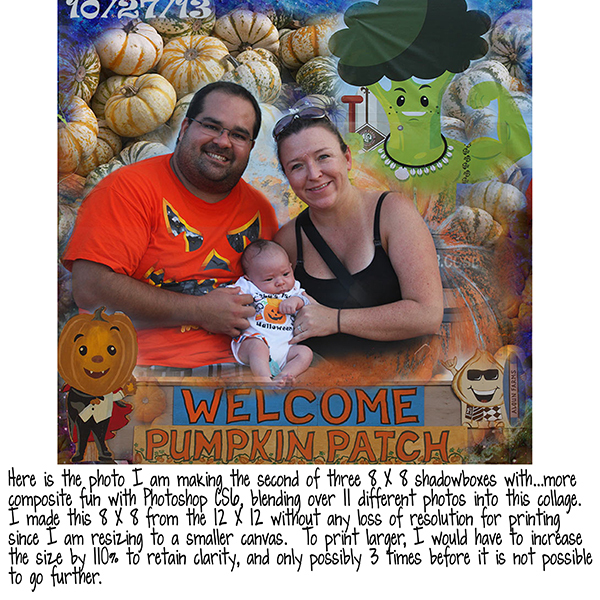 In today’s post I will be showing the process of making the first of three shadowbox collages with a fall theme, including my new grandson of course! Little Danny boy was just 3 weeks old in this photo. I already have three shadowboxes that are 8 X 8, and right now I am “shopping” at home! So the size has been determined by the stash. 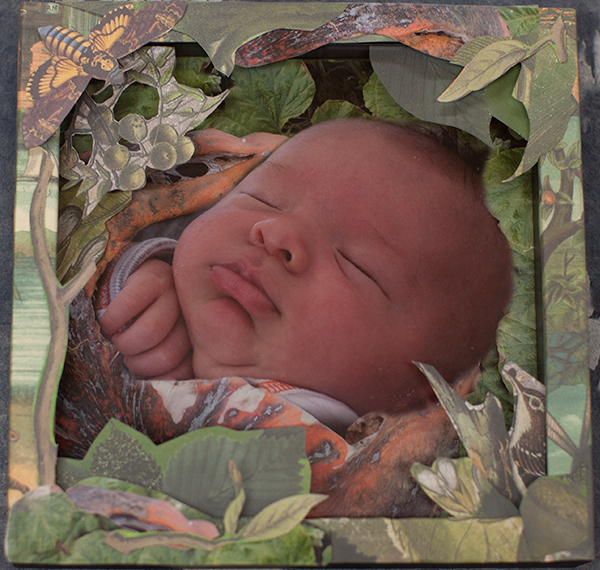 I love shadowboxes that have three main parts, the outer box, the inner box, and the backing. These particular shadowboxes have a glass sheet that fits inside the outer cover. 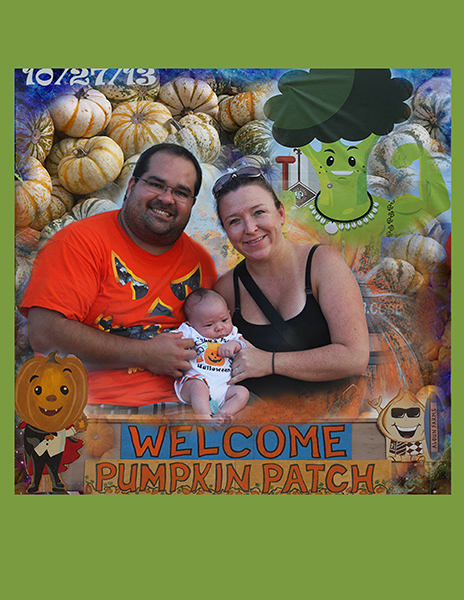 I did the exact same process of adding the green in a layer below the photo…this was the same PSD file as the “pumpkin baby”, I just turned off this layer when saving the jpg file of the pumpkin photo, and vice versa. 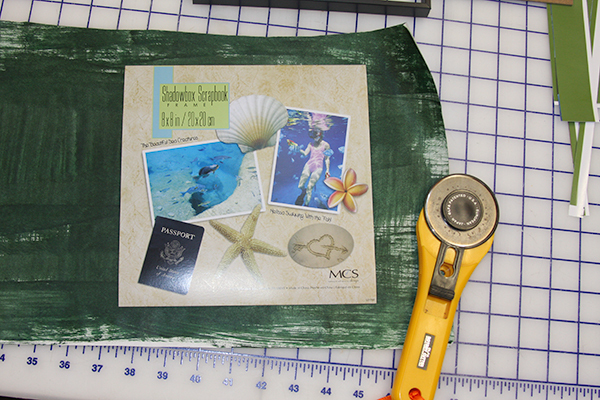 While these two photo files were printing, I made some Photoshop backgrounds to cut up for the outer box. 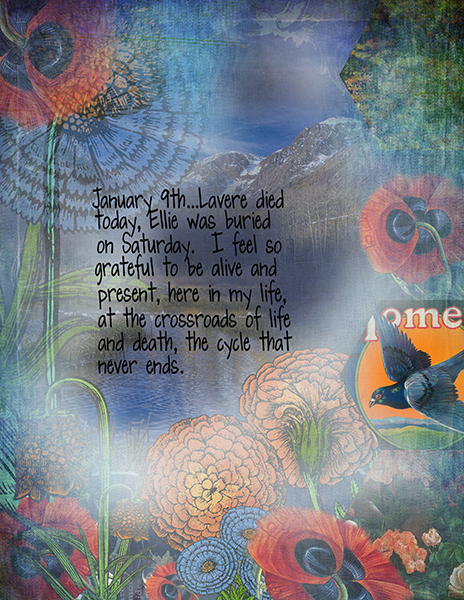 I wanted to cover the outside of the shadowbox because it was black and also more opportunity for cool collage. 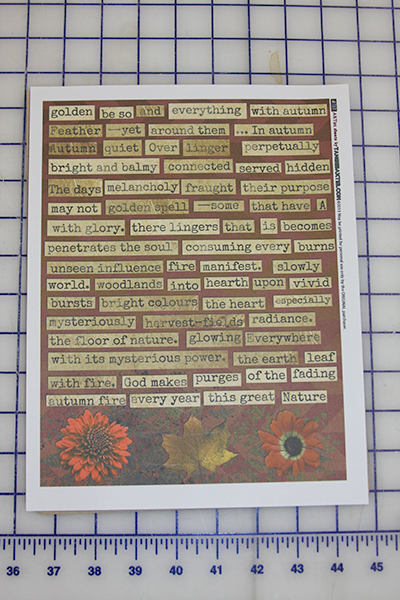 I used Tangie Baxter’s kits, “Field Notes: Fall”, and “Fairies”. 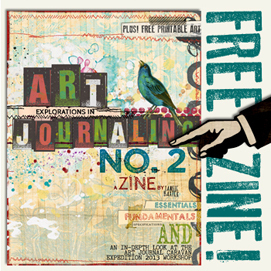 In the middle of making these three 8.5 X 11 files to print, I received my Art Journal Caravan email from Tangie with the news that the 2013 Collage Mania collection was available in the ScrapbookGraphics store! 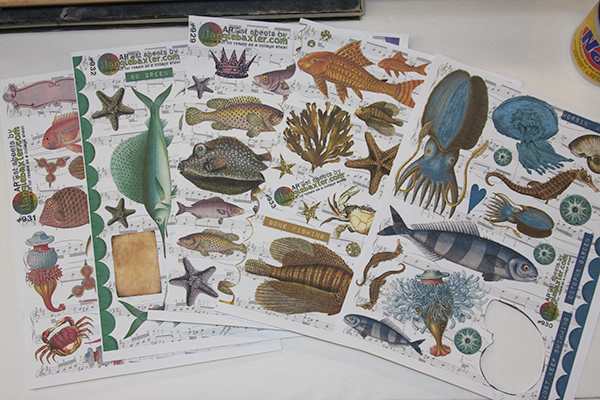 So of course my plans for the boxes needed to alter to include some of the collage sheets printed out. 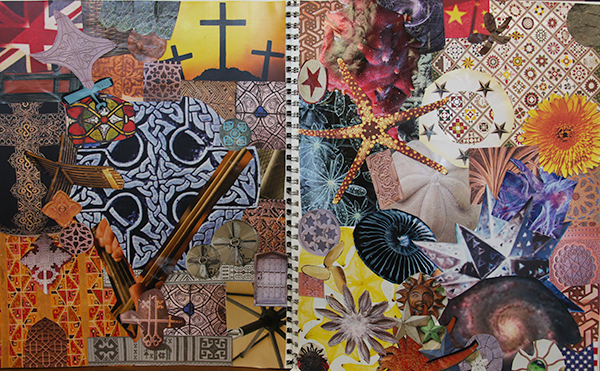 Below is an image of one of the collage sheets I used, along with #694, #707, and #768, and the preview. I highly recommend checking out the new 2013 collection as it is on sale right now and fabulous! 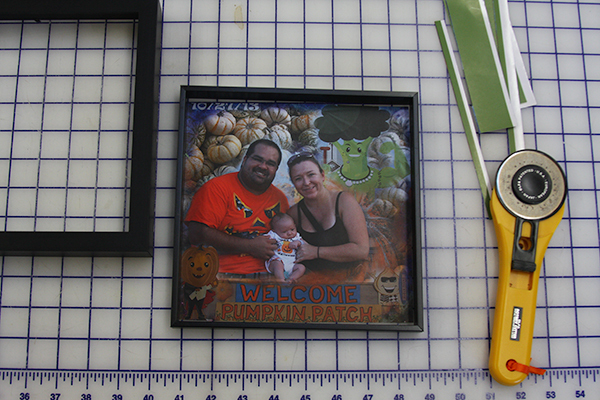 The next step in prepping my printed photos, after giving each a bit to dry completely, is to trim off the white edges. I use a rotary cutter to eyeball these types of cuts, but a craft knife or scissor works fine. If you are using a rotary cutter, please, please practice safety at all times…these are essentially rolling razor blades that are super sharp and deadly to tender fingers. 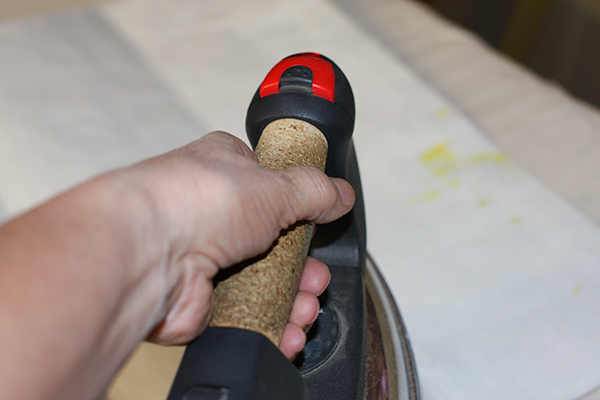 Always use the safety guard every time the cutter is put down, and keep your other hand to the side or behind the blade. 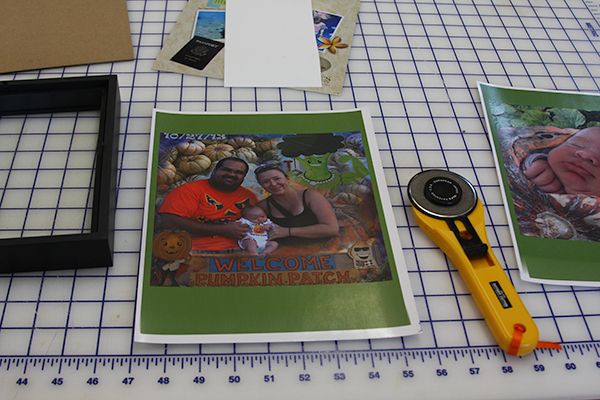 Having said all that, I adore cutting photos with a rotary cutter for clean, effortless trimming. 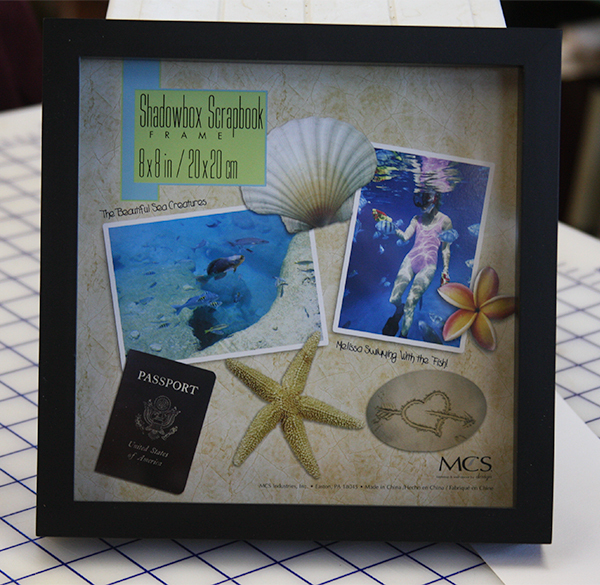 Next, I will then confirm the size of the shadowbox inner area for the photo using the printed paper ad. I cut the photo paper edges away, then re-confirm using the inner box. 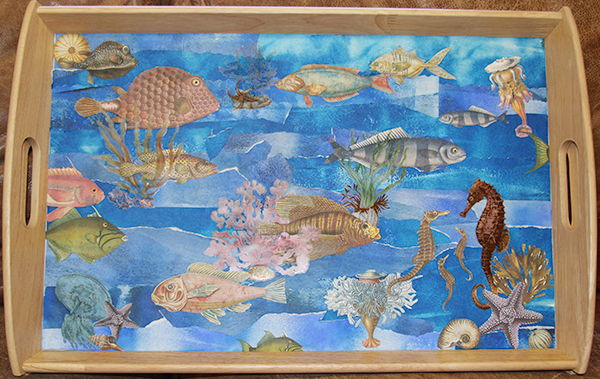 Then I cut a painted backing paper as I have never seen a shadowbox that is exactly 8 X 8 or other designated measurement. I use the same inner paper ad as a cutting template, then using double-sided archival tape, affix the paper to the backing of the frame first. 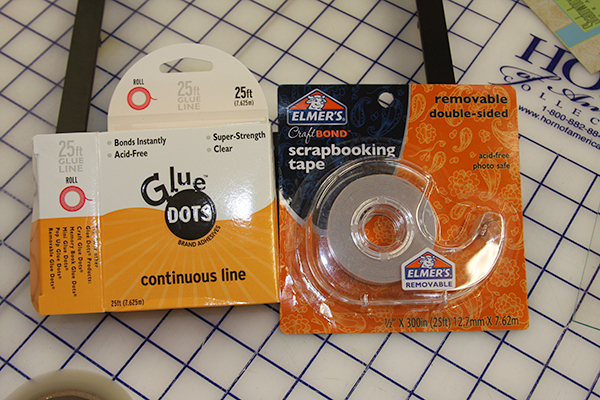 Here are the two glues, above, that I used for this project. Obviously similar products will work just fine. 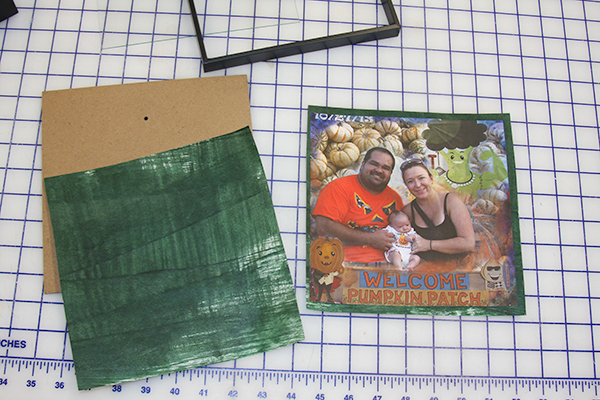 I avoid using wet glues with photos that are home printed, and frankly, most of the time regardless, just to be safe. 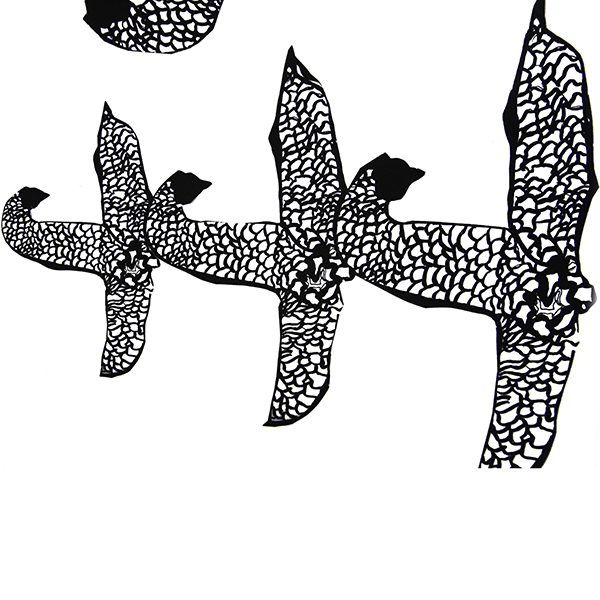 The continuous line glue dots I mainly use for the decorative bits later on. I use the tape lining up to one corner, then peeling off the protective cover, all around the square. 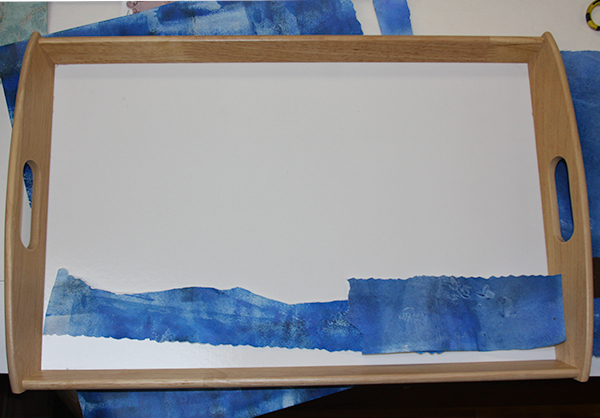 Then I line up the top two corners of the painted paper and firmly press down. I smooth from the top to the bottom, then turn the backing over and trim right up to the edge of the backing with the rotary cutter. Once I have the painted paper mounted and trimmed, I center the trimmed photo into roughly the middle of the backing, confirm with the inner box, and tape “glue” the photo down. Be gentle smoothing over the surface of the photo, and consider covering the print with tissue or other paper first just like a press cloth when ironing. This is another reason to wait until the photo is absolutely dry before mounting. Now comes the really fun part…decorating the outside. 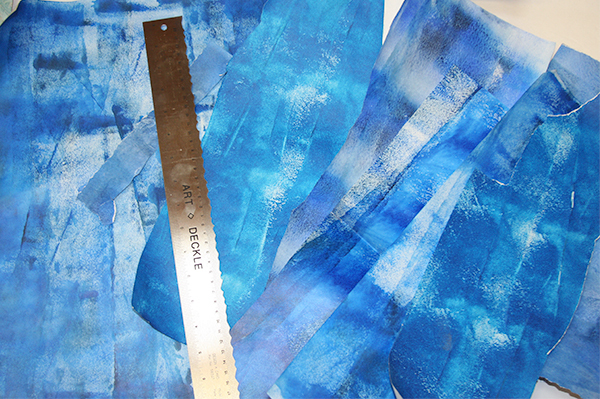 Using one of the collage sheets, I made a measurement of the length, and cut a strip of paper. There are many ways to do the next steps, so my way is not the proverbial highway! Some folks would rather do strips for each part, but I find that a bit tedious. I line up the front inner corner with an extra 1/8 inch, make a fold along the outer box, then holding the outer box upright, I make another fold from the side to the back. Then I poke my index fingernail into the inner corners in prep for the continuous glue line. Laying aside the folded paper for a moment, I attach a glue line to the inner bitty frame, then double-sided tape to the edges all the way around to the back. 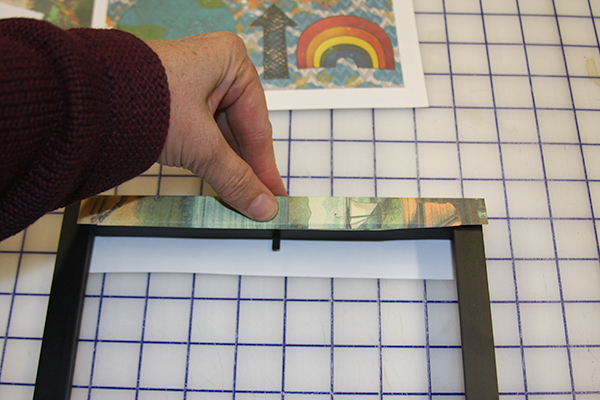 Now I line up the fold on the outer side first, and press down firmly, then the inner portion of the frame. 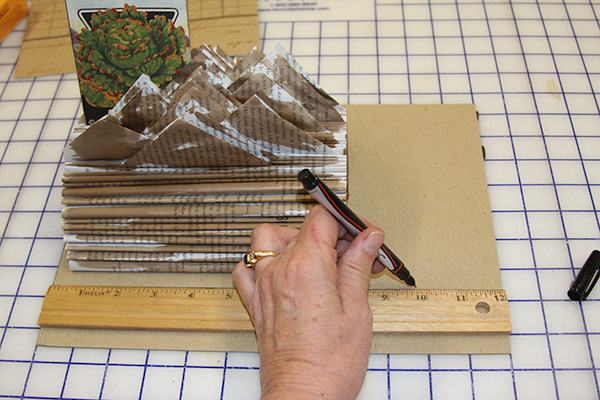 Third, I hold the box upright again and smooth my hands over the paper from the center out. Last, I press down the portion that wraps around to the back, trimming carefully if there is excess paper. I repeat this for the opposite side of the box first, then piece together the other two sides using the same method. I once again confirm that all is attached. Now I line up the mounted photo, the inner box over the mounted photo, and the outer box on top. I want to add further cut pieces of the collage sheets and my printed backgrounds to the outer and inner portions of the shadowbox and I want to make sure I don’t obstruct a clear view of the photo itself. I used the glue lines on smaller pieces like the branches, and the double-sided tape for larger pieces and underneath the bits that I mounted inside the inner box to create depth. So here’s another look at the first finished shadowbox…it’s late now and I’m off to bed, planning on finishing the other two tomorrow! 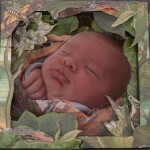 After a fabulous 12 days with my new grandson, I am home and happily working away in my studio. The weather has shifted towards late fall and early winter and my thoughts are turning towards upcoming holidays. Today I am going to show you a project that is a terrific hostess gift for a holiday party or even just a lift for your own kitchen! Ok, Grandma Rain is now willing to move on to art! 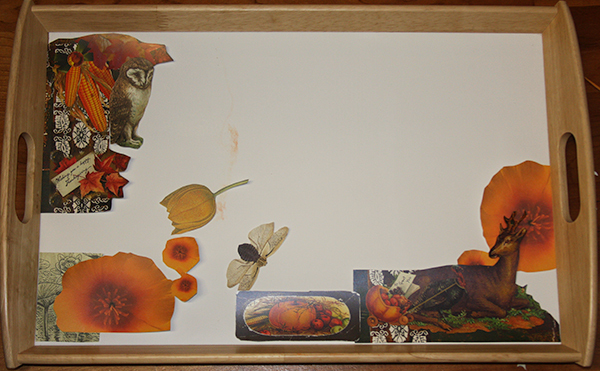 I bought these two wood edged trays at IKEA in the sale bin for under $10, with the thought that a collage in the center would improve the look drastically. 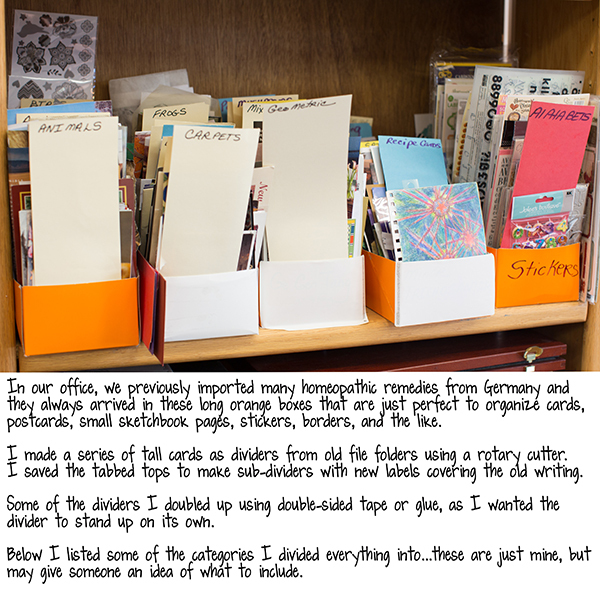 Given that the center was a melamine type of surface, I used an appropriate glue and printed out various bits and pieces from Tangie Baxter’s kits, including El Cuatro Day of the Dead, Field Notes: Fall, and the Collage Sheet mania package. 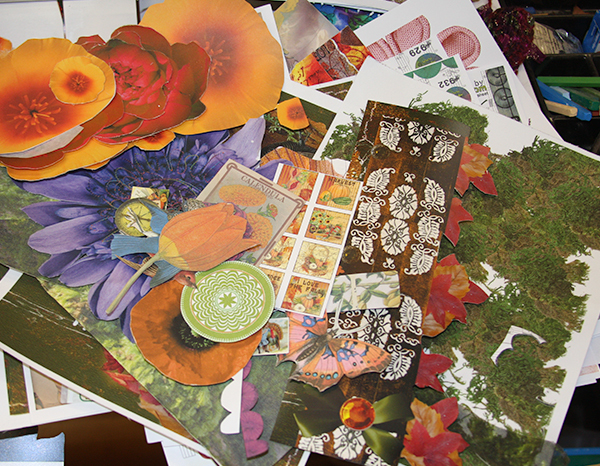 I also gathered up leftovers from my collage bin stash from previous projects. Here is the empty tray in all its non-glory! The wood edges are lovely, a soft finished pine, so I could see the potential. I had a few different ideas so I first gathered up a batch of leftover printed “Tangie-ness” to layout some possibilities. 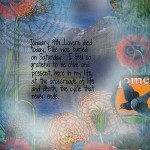 I decided to go for poppies and fall themed items and tried out a few layouts. The second image is not glued, just laid on top of the tray. I was happy and decided to start applying glue, and of course changed my mind half a dozen times! 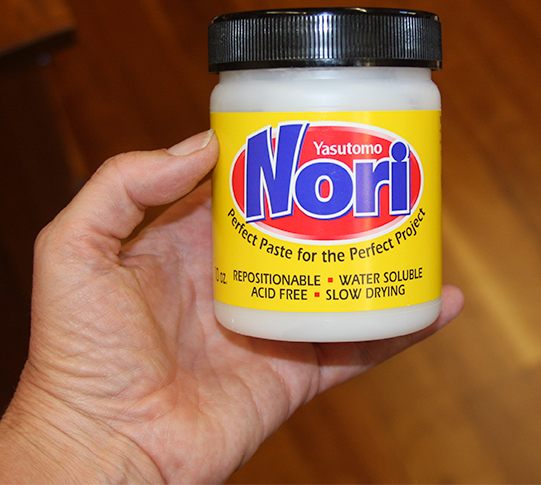 I used Nori glue made by Yatsutomo brand as I knew it would stick to the melamine surface of the tray, and is water soluble for easy clean up. Plus it gives a bit of time to reposition! 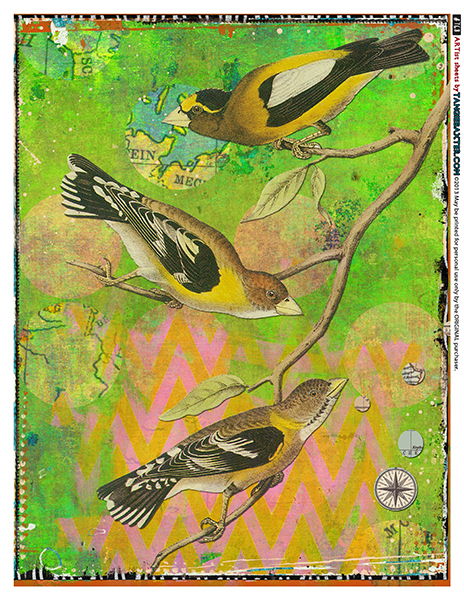 I started on the left and moved to the right, applying the glue to the back of the collage bit with a glue brush on top of an old catalog. 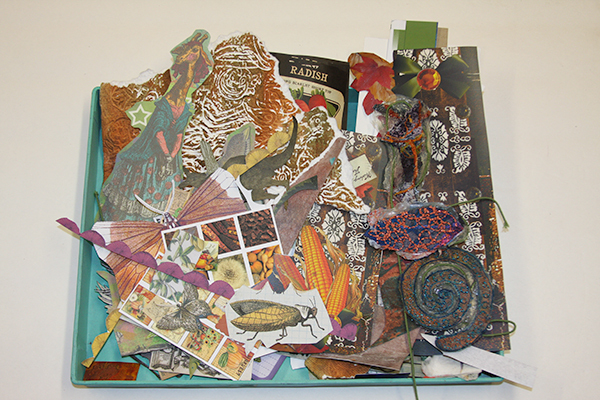 I just turn the page whenever it gets too much wet glue, and eventually toss into recycling. 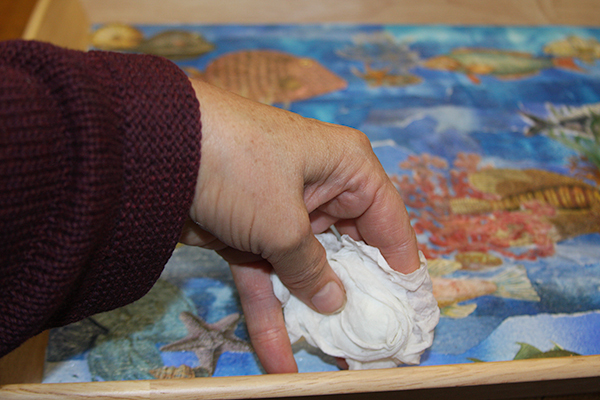 I then let the finished tray dry completely before adding a sealant to the top for waterproofing. In Colorado this takes about an hour! Most climates that have some humidity and aren’t at 6000 feet in elevation would require at least one day to fully dry and harden before applying the sealant of your choice. 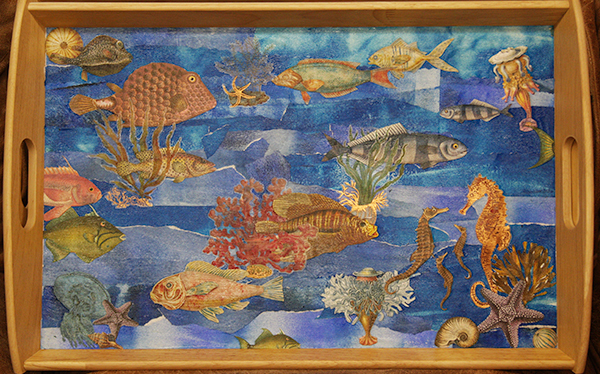 Here’s what I did for the second tray, using collage sheets from Tangie’s “Purple Tide”, and other ocean related kits, on a background of my own painted paper leftovers from another project. 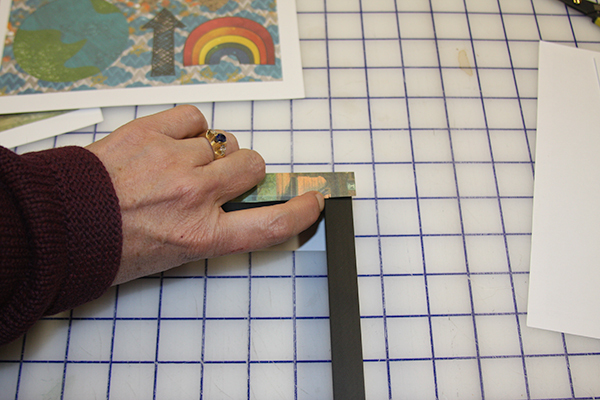 I tore the background papers into strips, and occasionally used the deckle edged ruler to tear against. 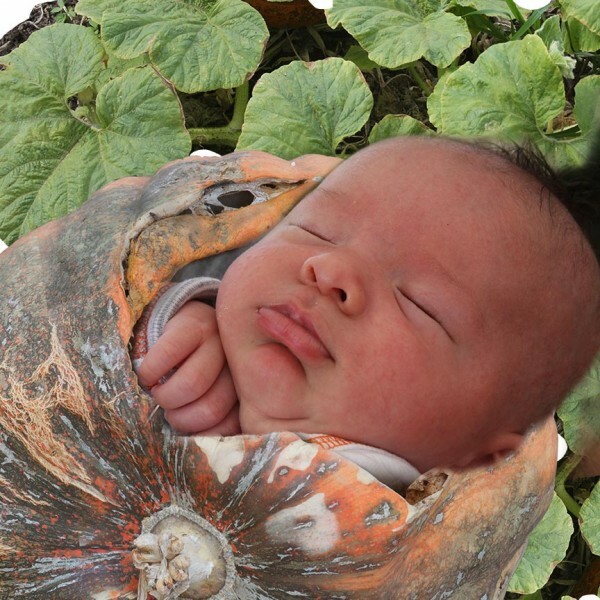 I then used the same Nori brand of glue to make the background first. 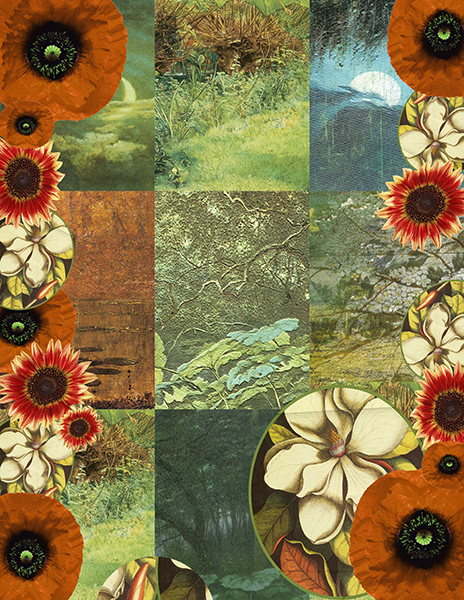 I did some “fussy cutting” around various bits from the collage sheets and added in a few other printouts from a Photoshop file I made from the oceanic kits. 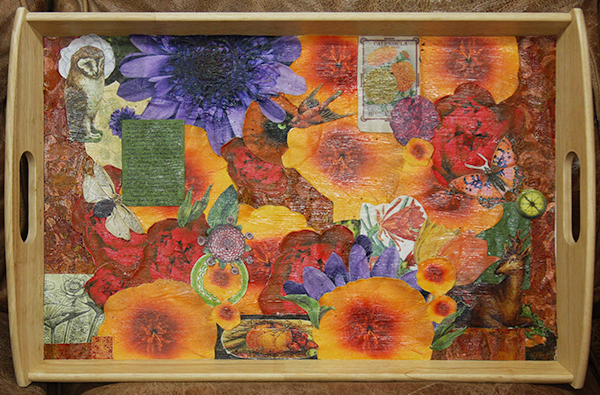 I glued each bit down to the background just like the poppy tray, then used a damp paper towel to wipe around the wood. I also let this tray dry for a good couple of hours here in Colorado before applying the Mod Podge outdoor waterproof sealant. 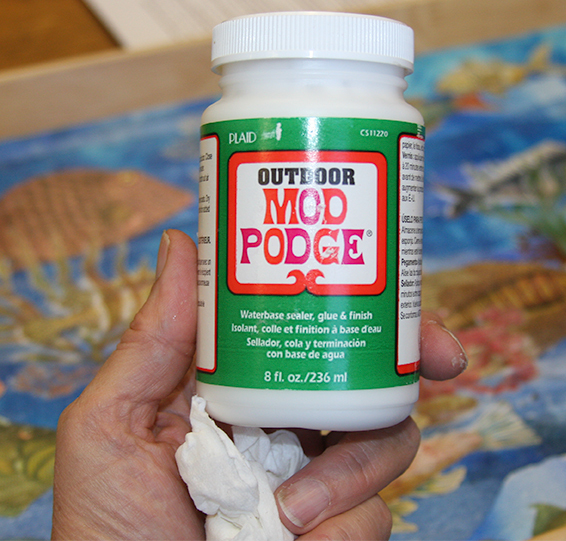 The sealant is your choice…I went with the Mod Podge because it is water soluble, doesn’t have an off-gas of fumes like most varnish products, and dries quickly. I also often use Polyvine Wax Varnish, available at your local hardware or paint store, if I can work outside. Today we had snow for the first time and I was feeling moody about getting chilled, so Mod Podge it is! 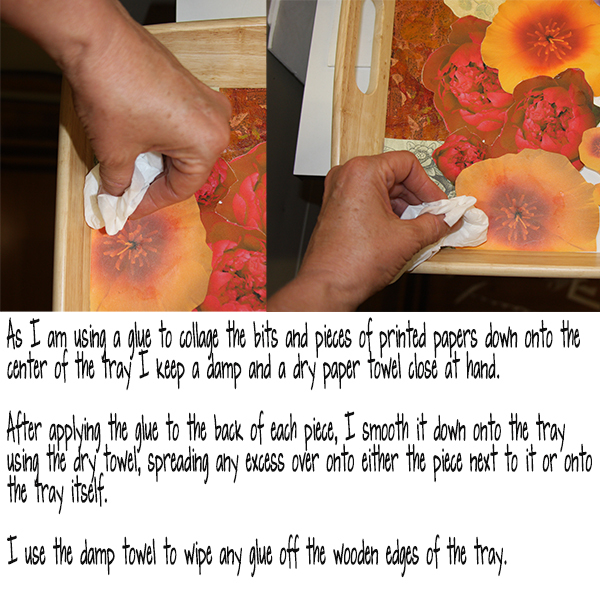 The image below the product photo is the second coat of sealant on the poppy tray…even in Colorado I allow each coat of sealant to dry for at least one full day, or two if it is damp and raining outside. Allowing the sealant to dry in several thin coats is far superior for waterproofing, which I desire for a tray that will be used for tea and serving food. The poppy tray isn’t even close to dry after two full days! 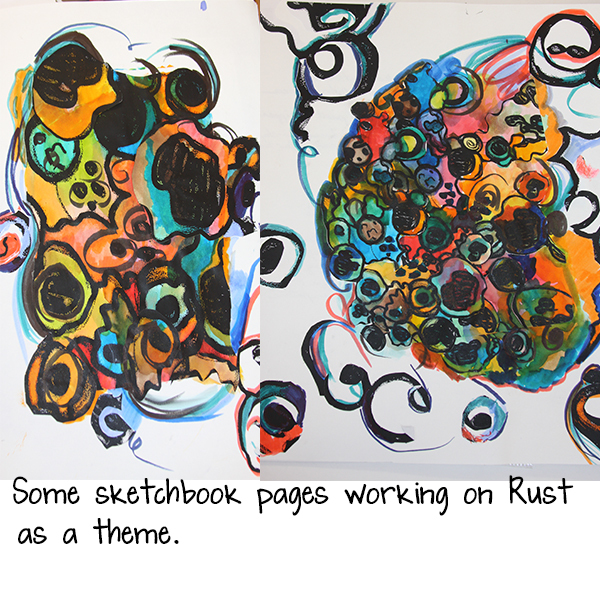 So until next week, I hope you find some time to play with art materials! It certainly has helped me recover from dental work yesterday.